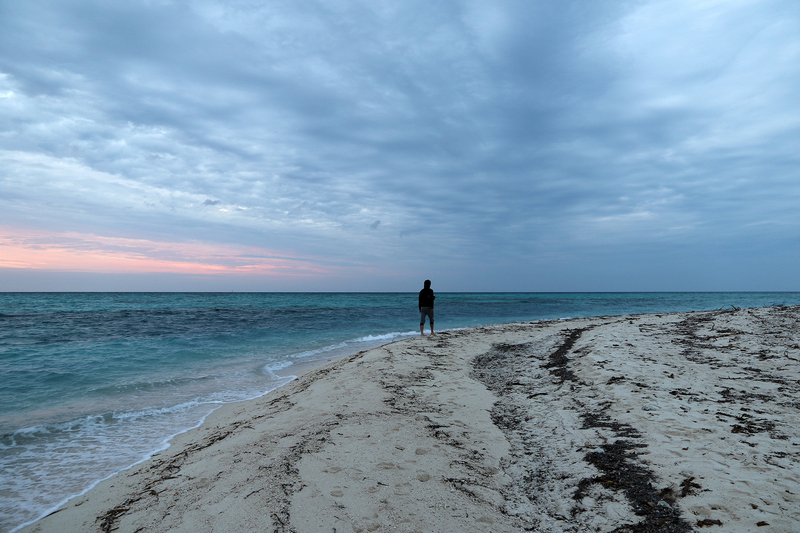 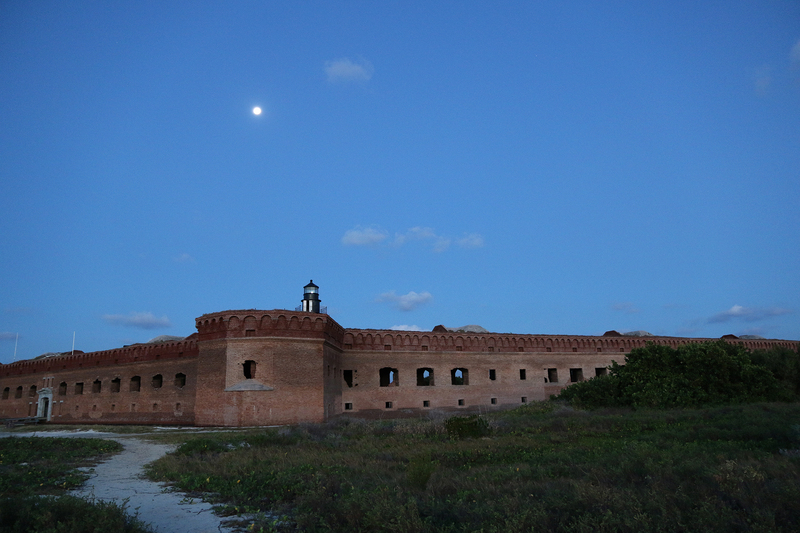 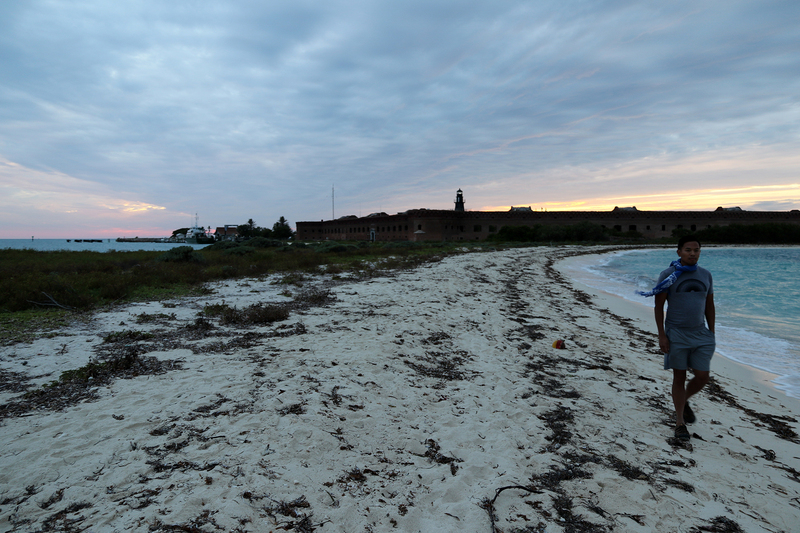 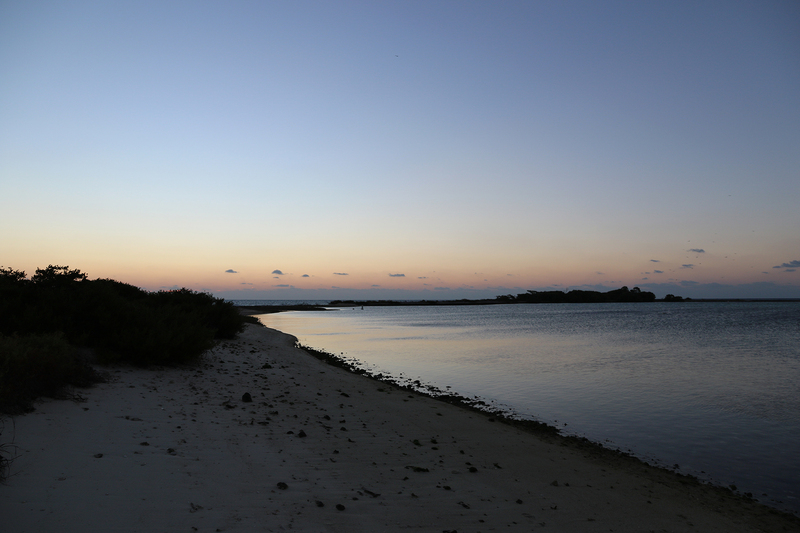 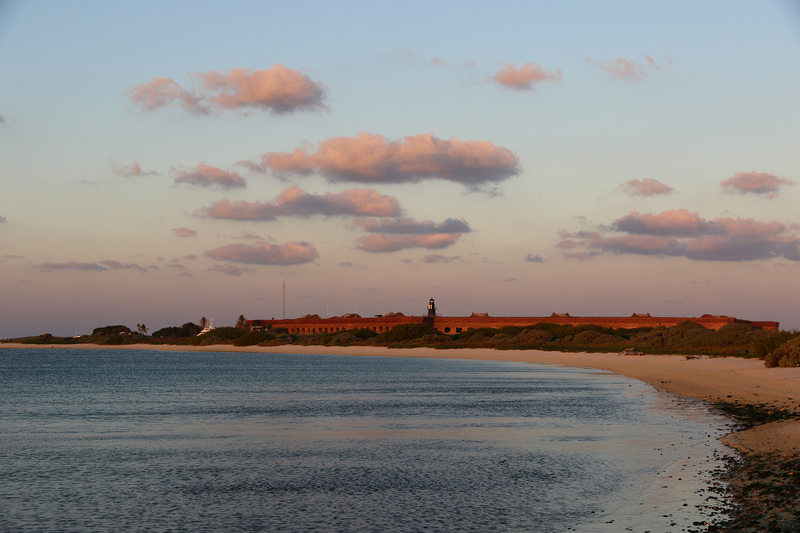 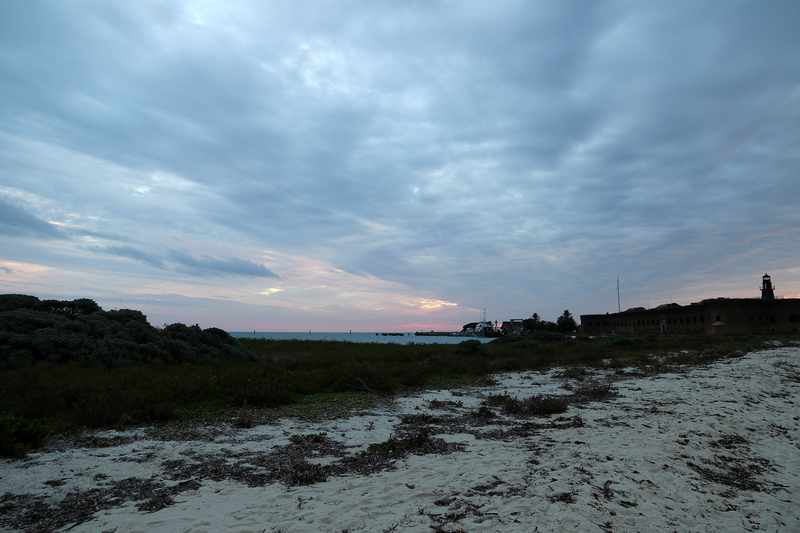 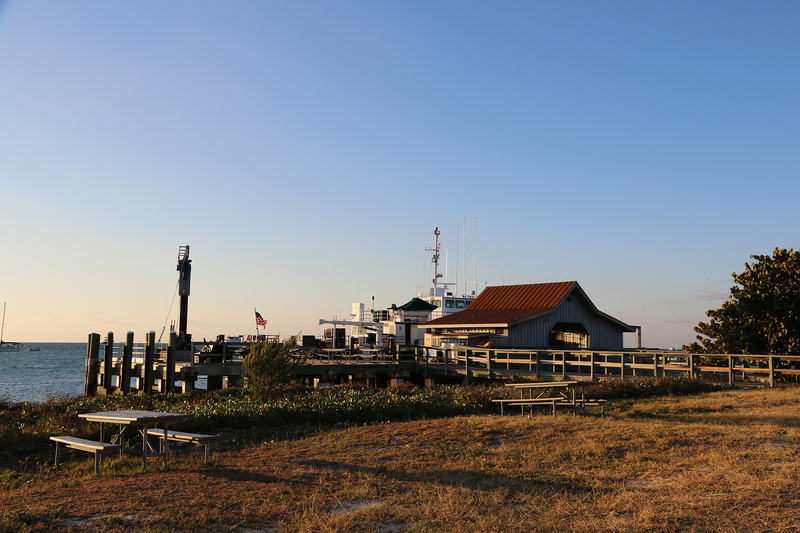 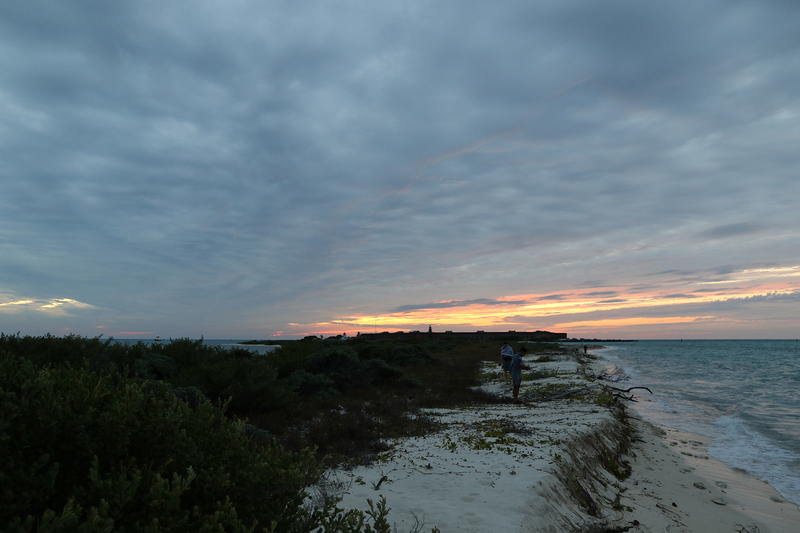 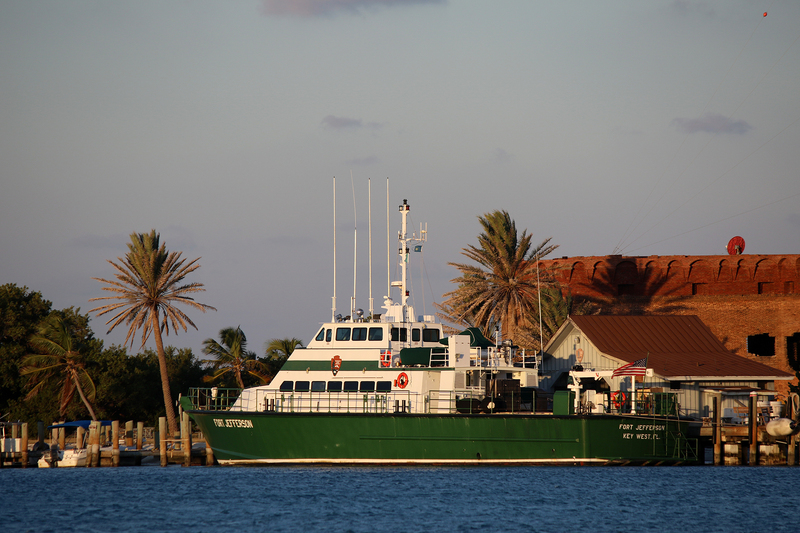 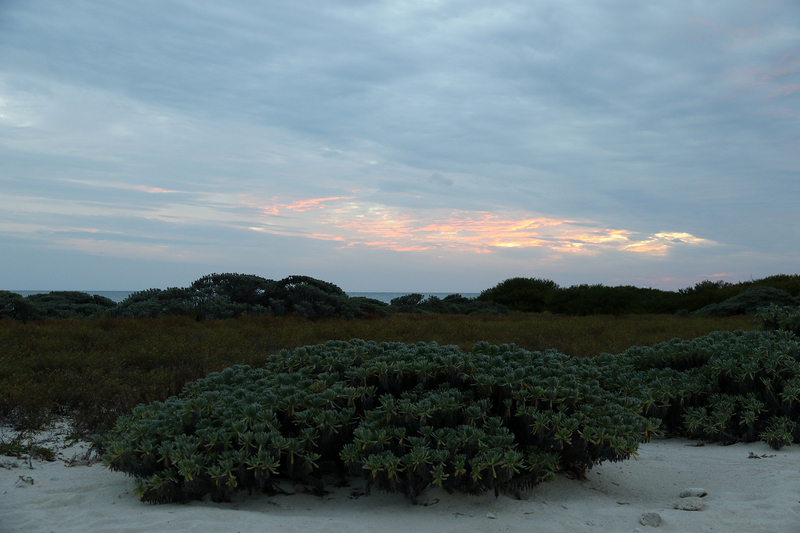 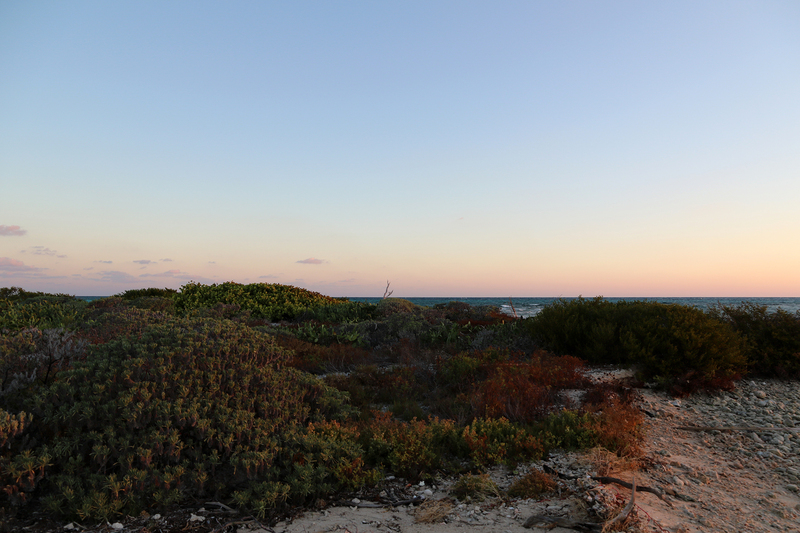 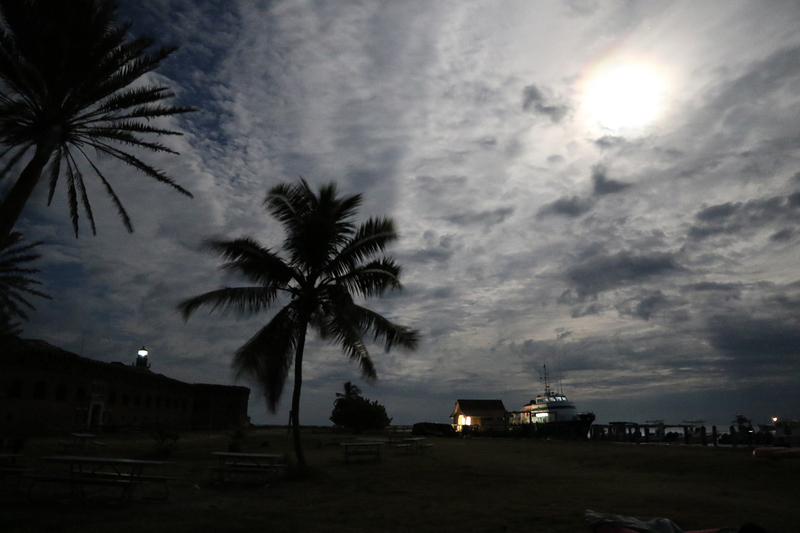 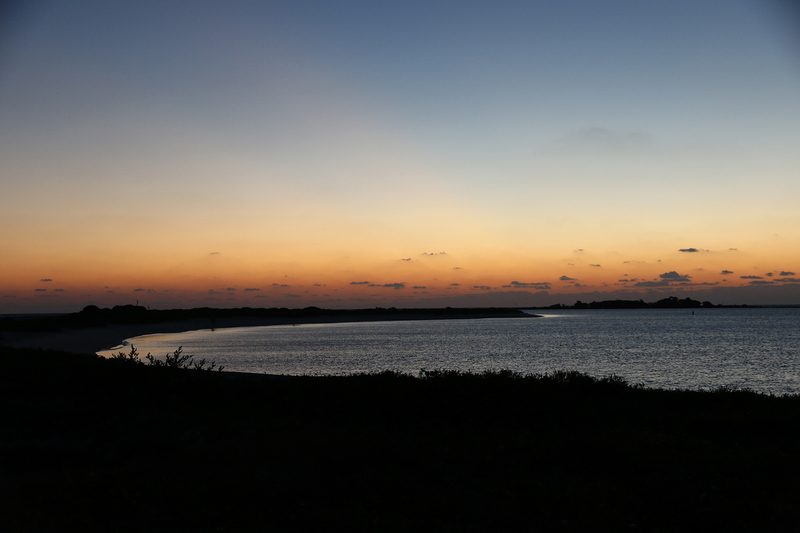 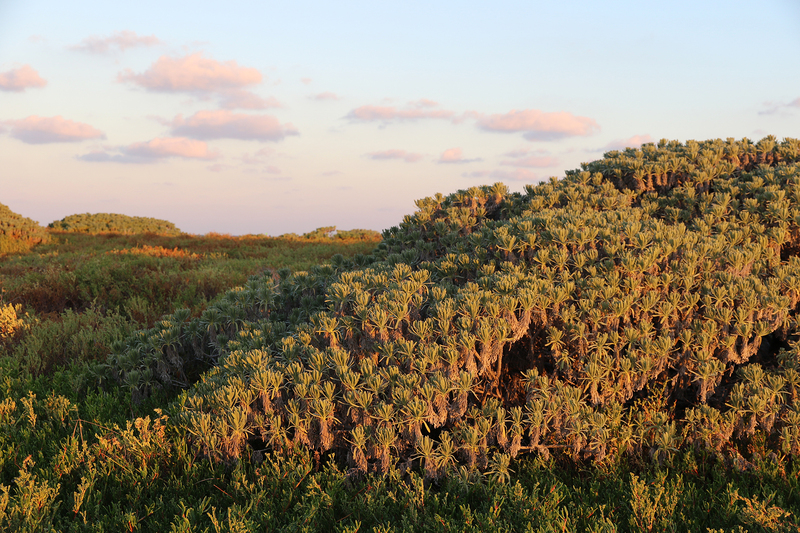 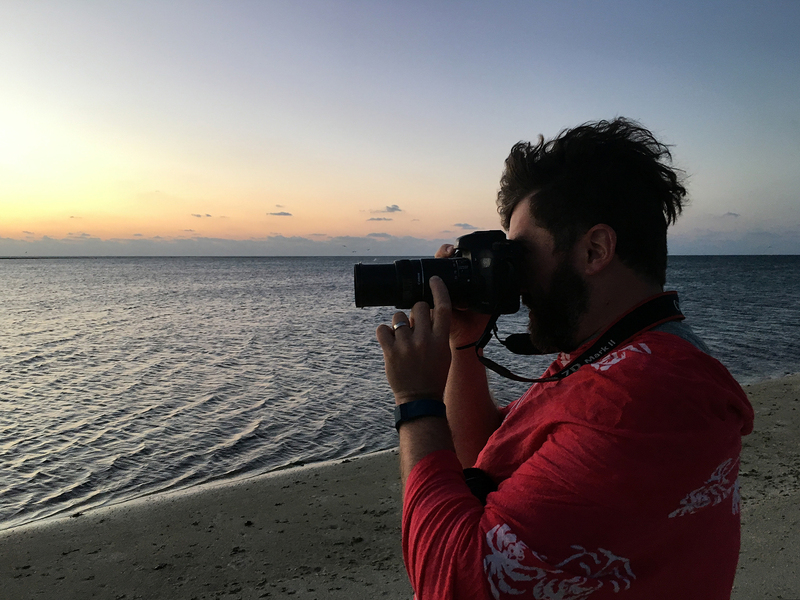 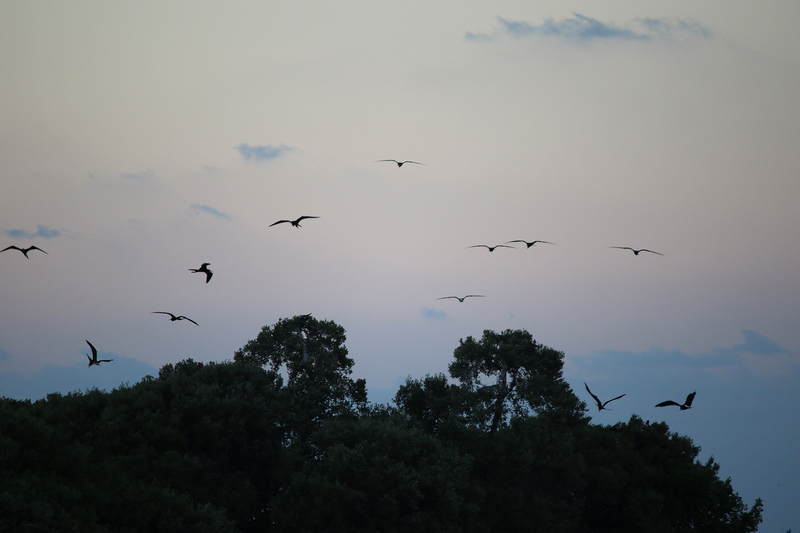 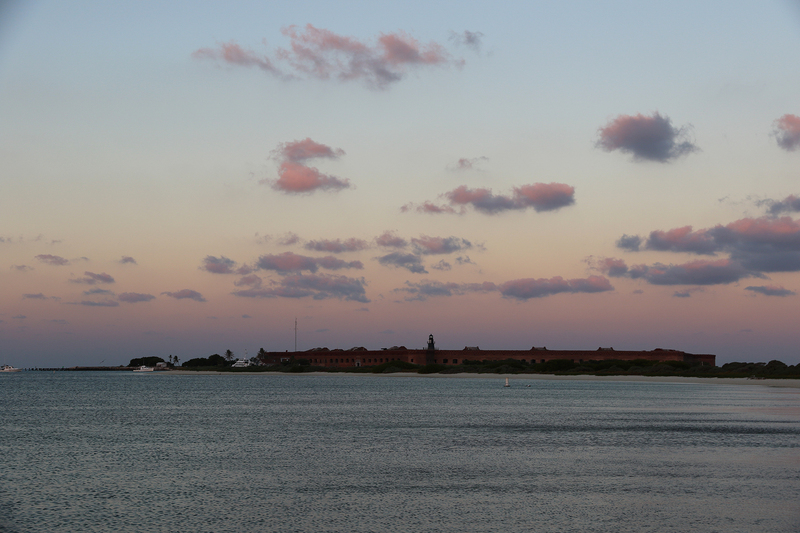 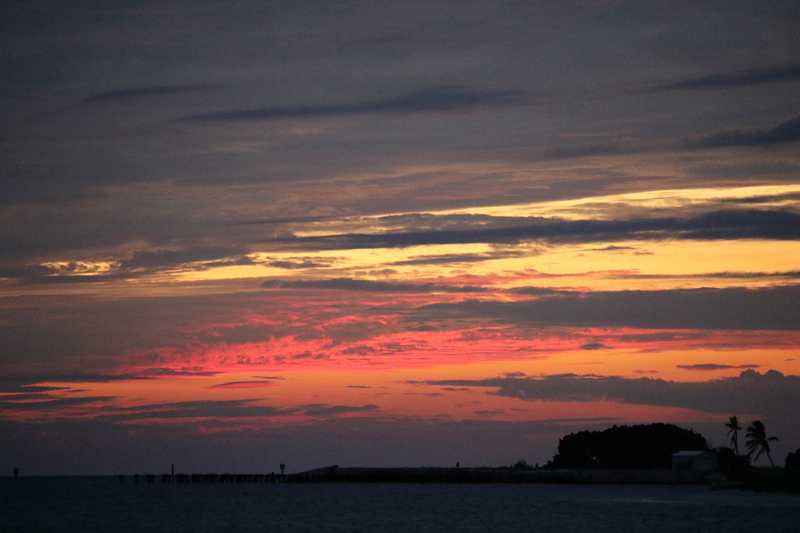 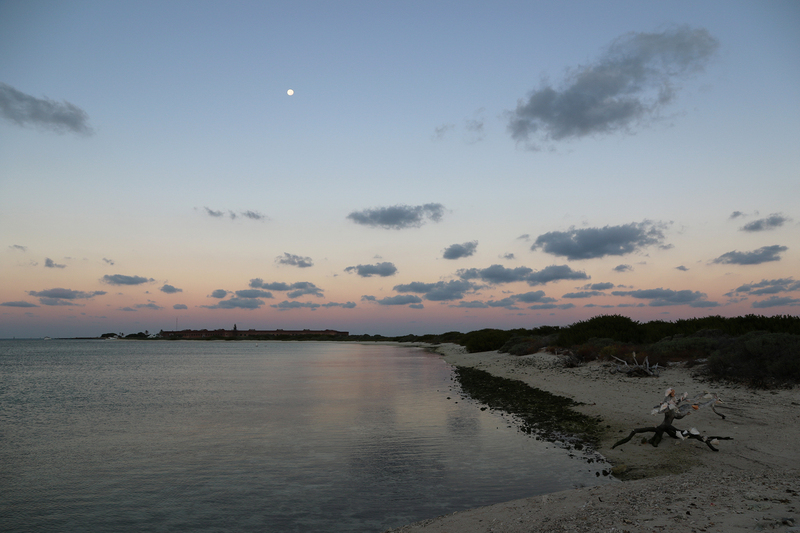 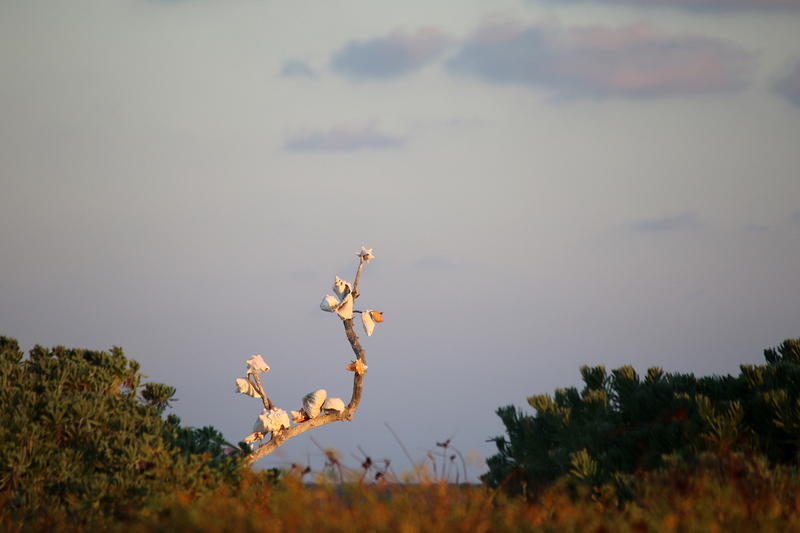 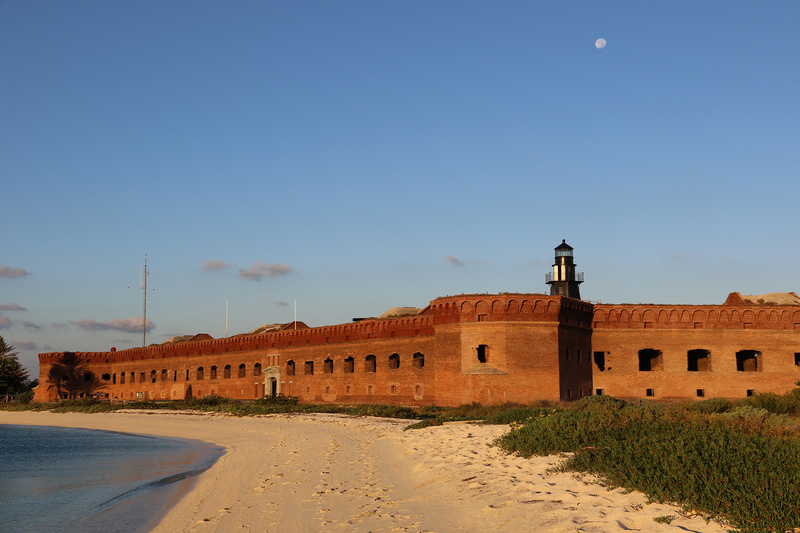 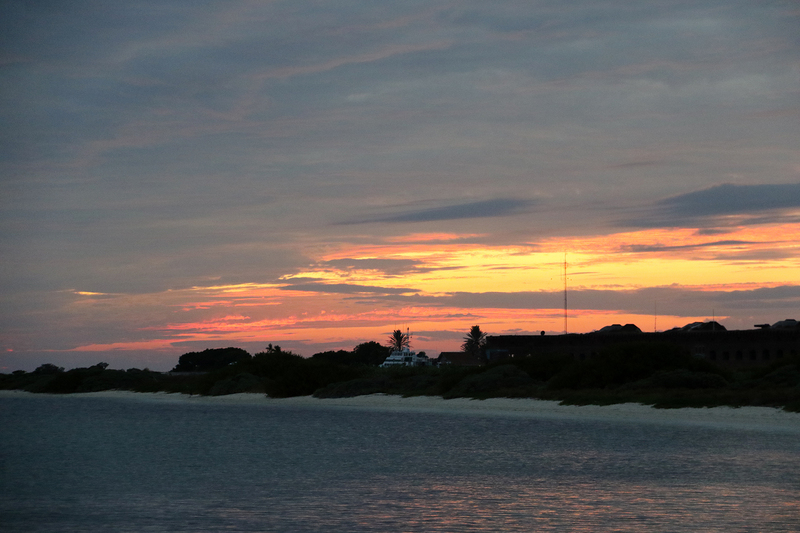 On November 15, 2016, evening approached the Dry Tortugas, and some of us made our way toward Bush Key, which we had dubbed “Bird Island,” for the sunset. 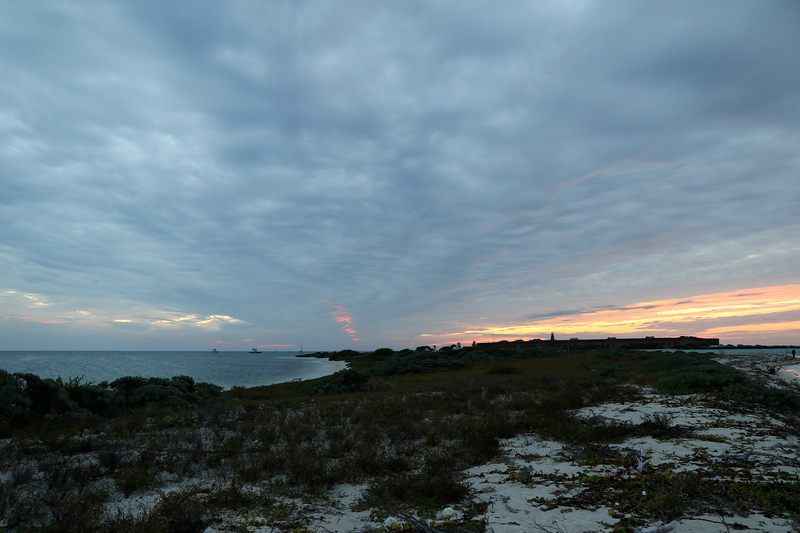 Twenty-four hours after first wandering out onto Bush Key for the previous evening’s sunset, the island not only felt more expansive, but this short walk felt like a trek (in a good way), even though it was less than a mile. 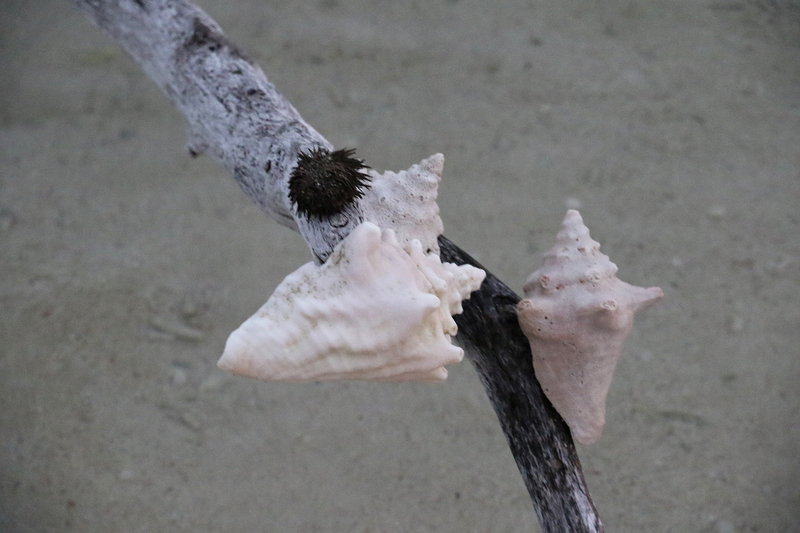 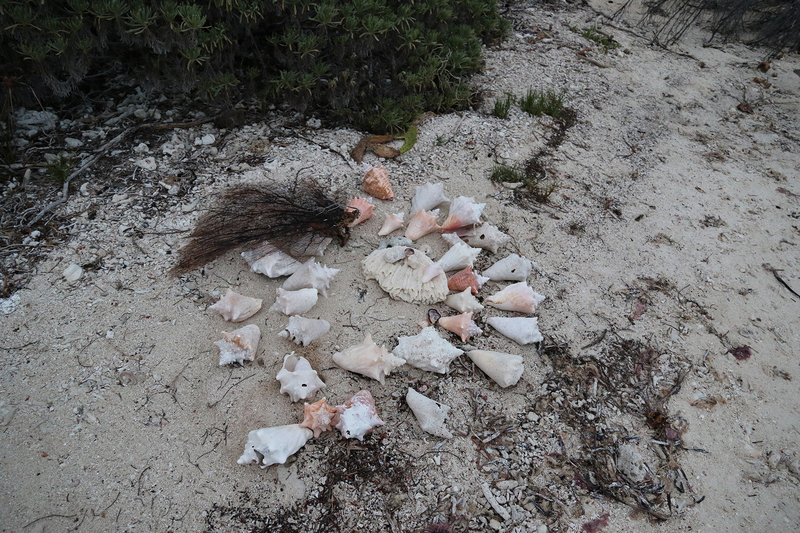 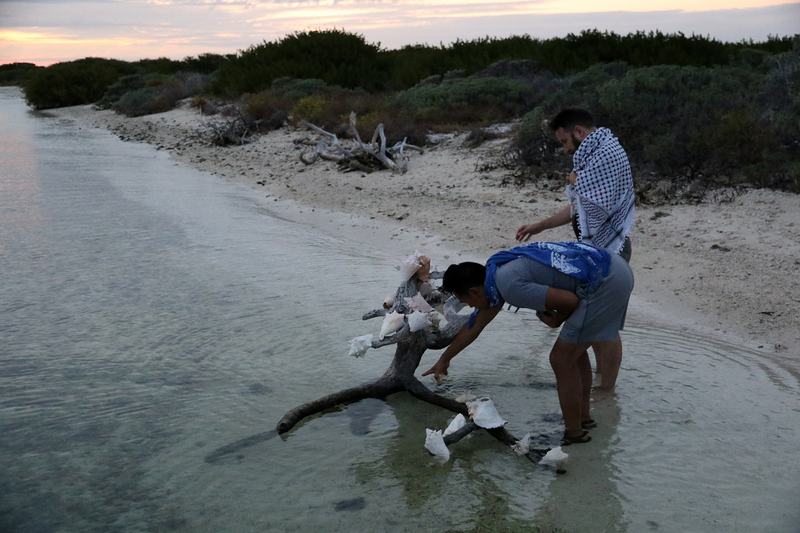 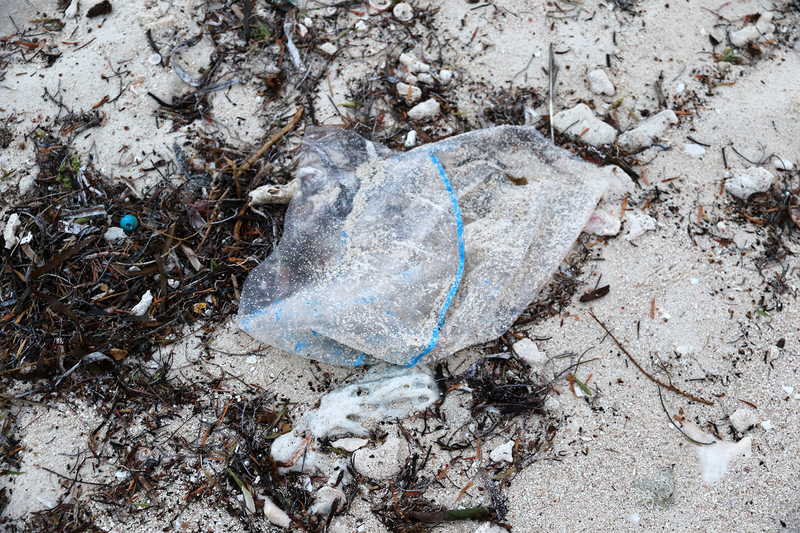 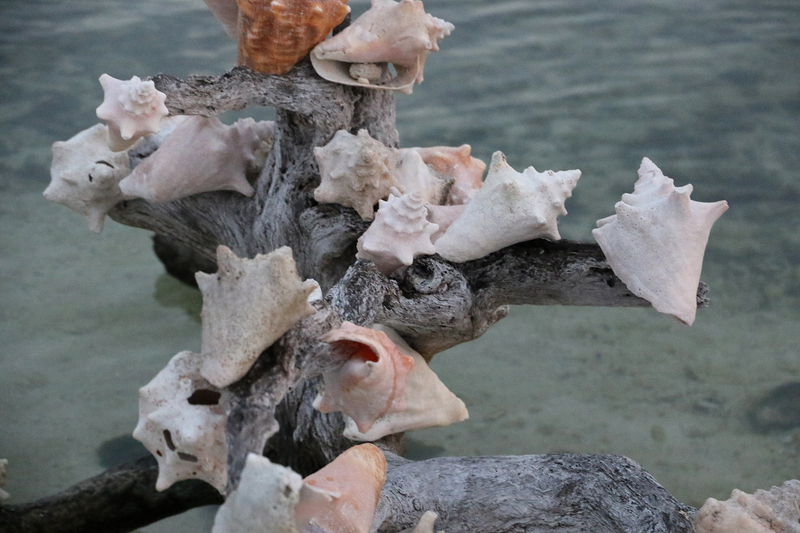 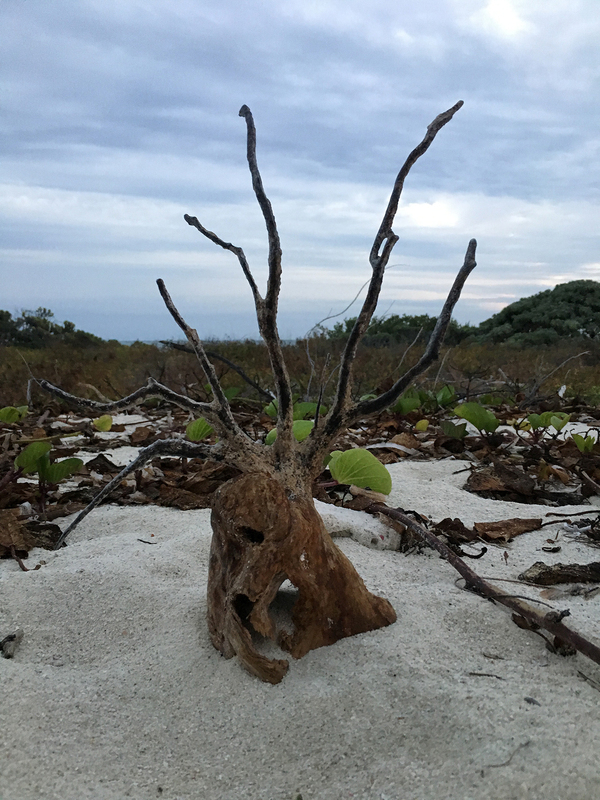 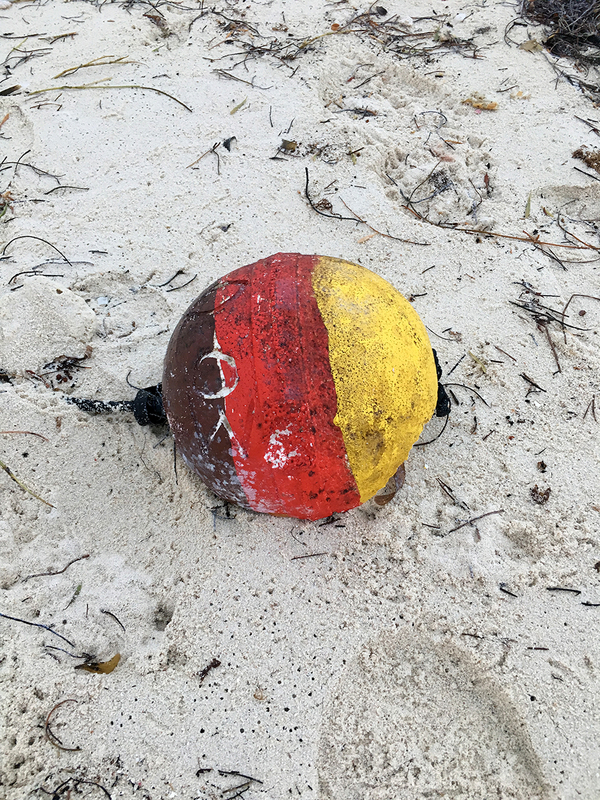 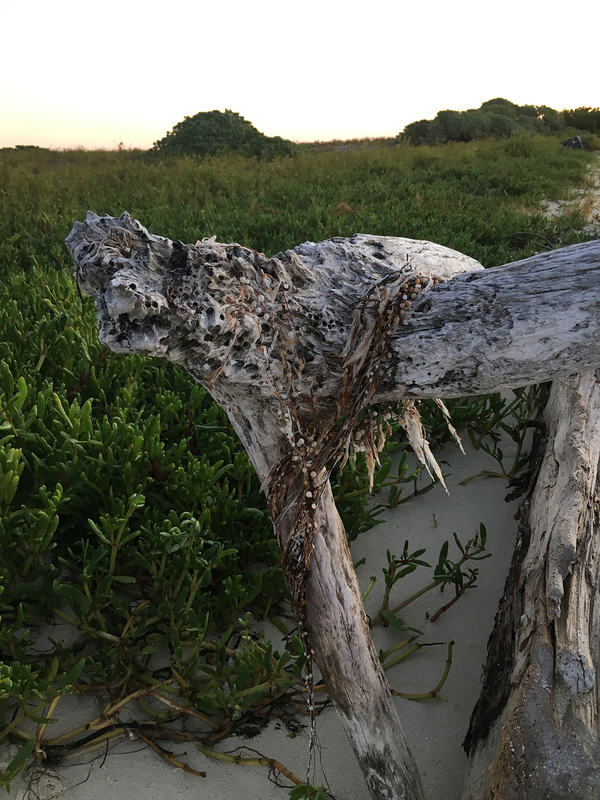 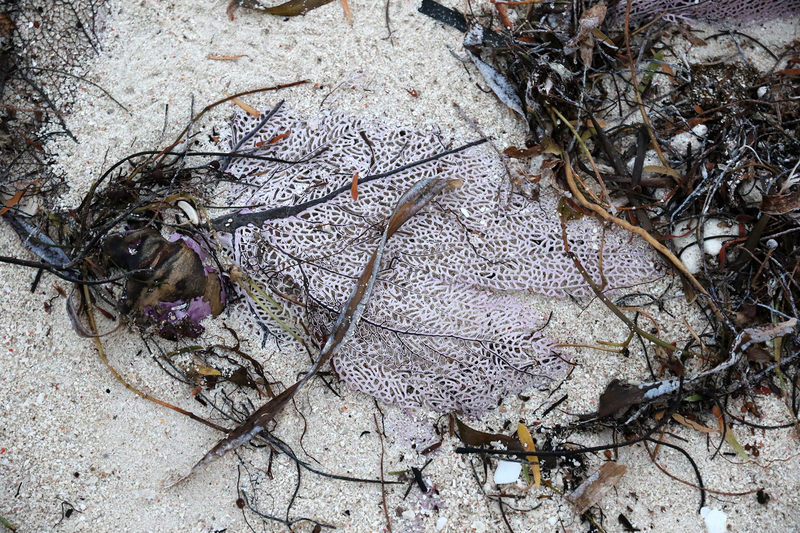 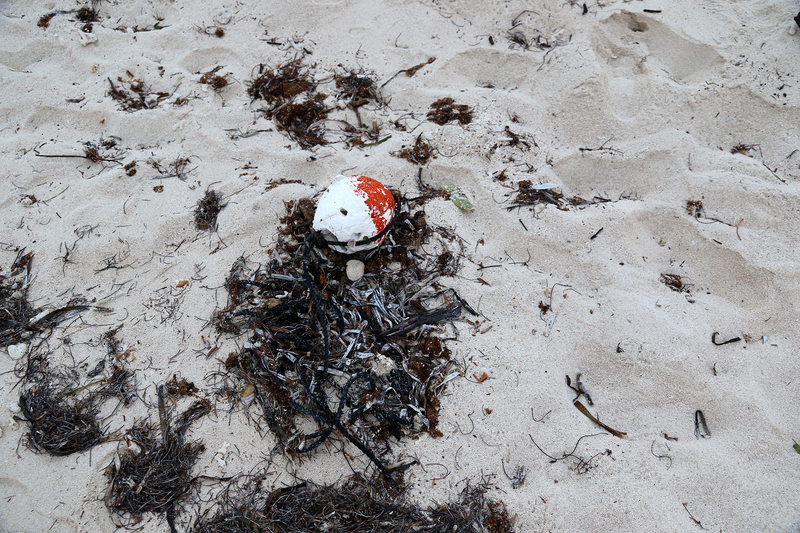 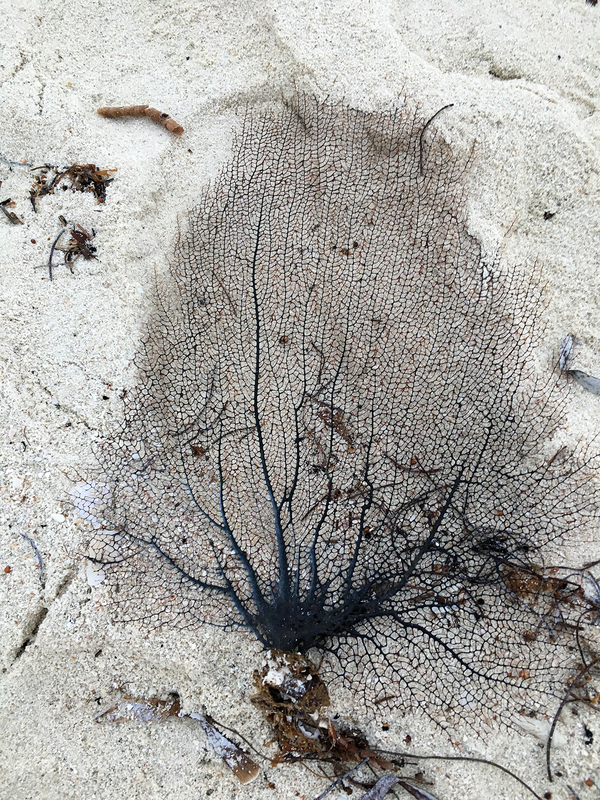 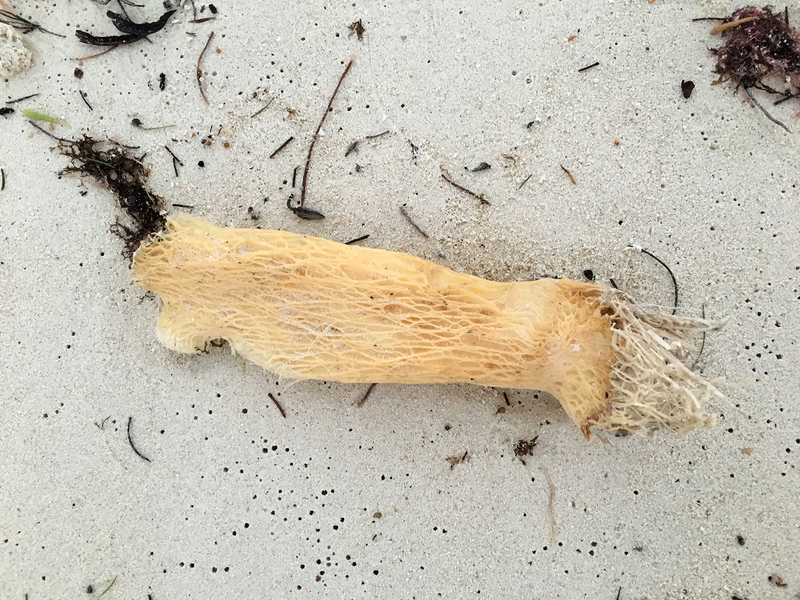 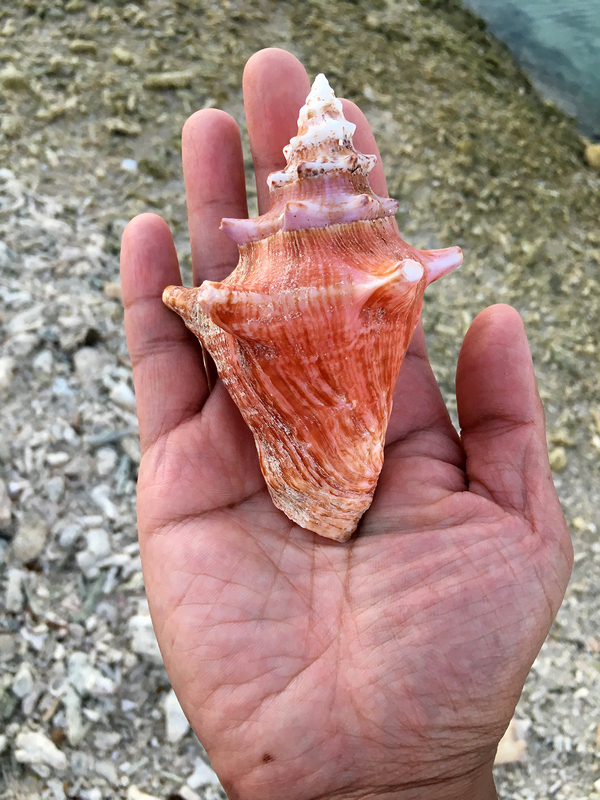 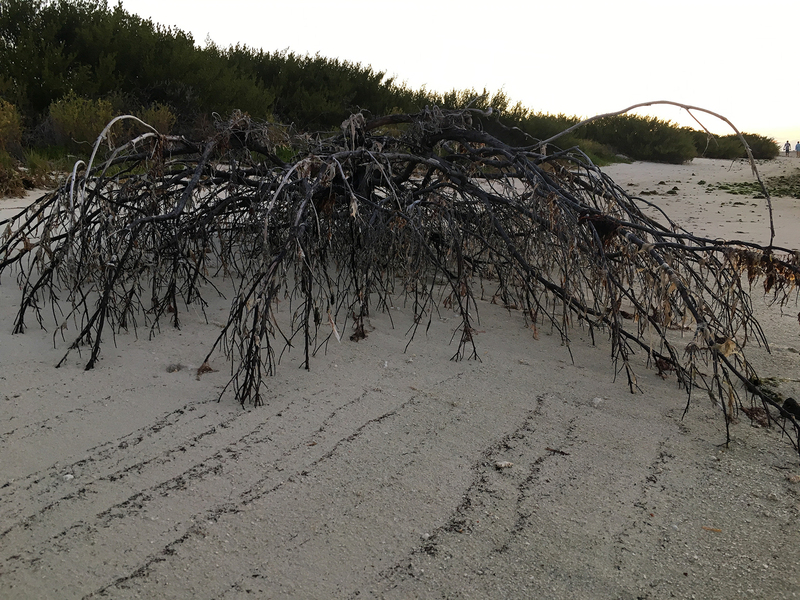 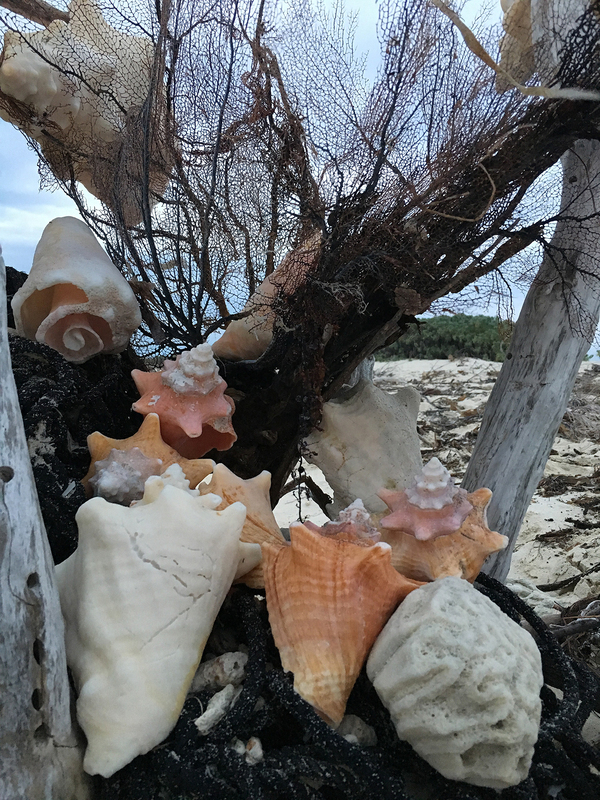 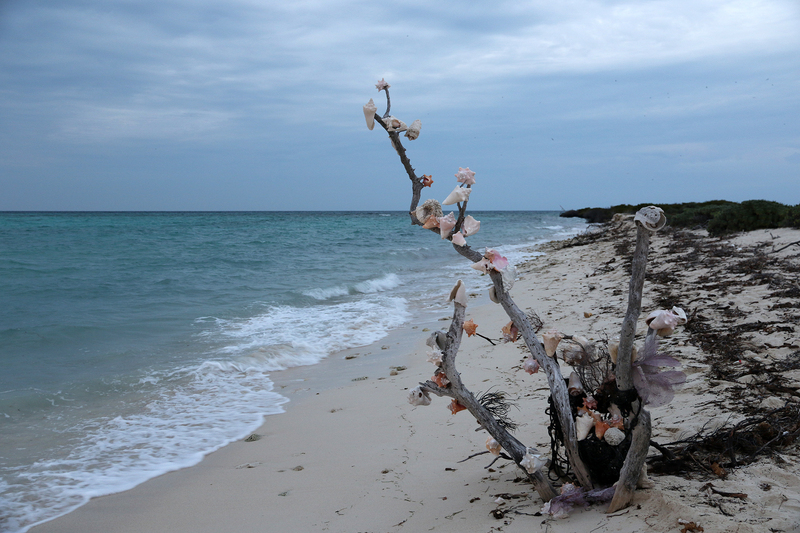 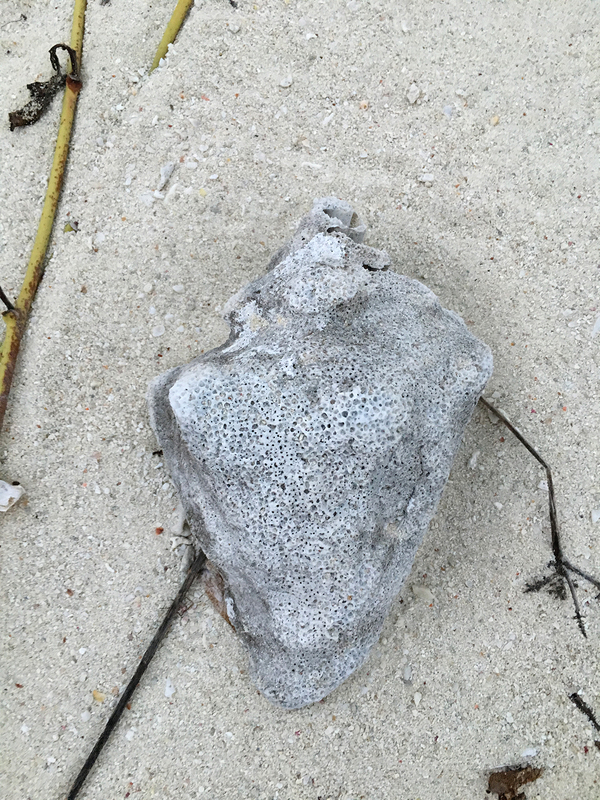 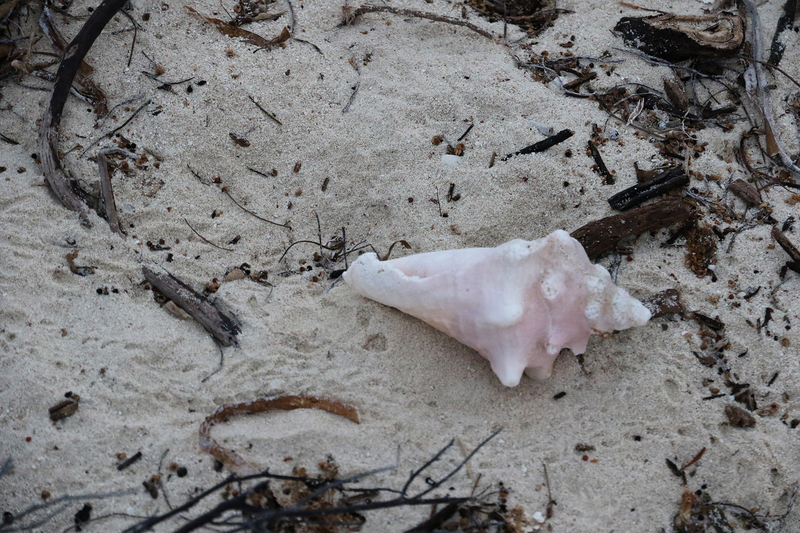 This time, we walked along the northern shore of Bush Key, which, unlike the protected southern shore, was littered with debris that had washed up with the surf. 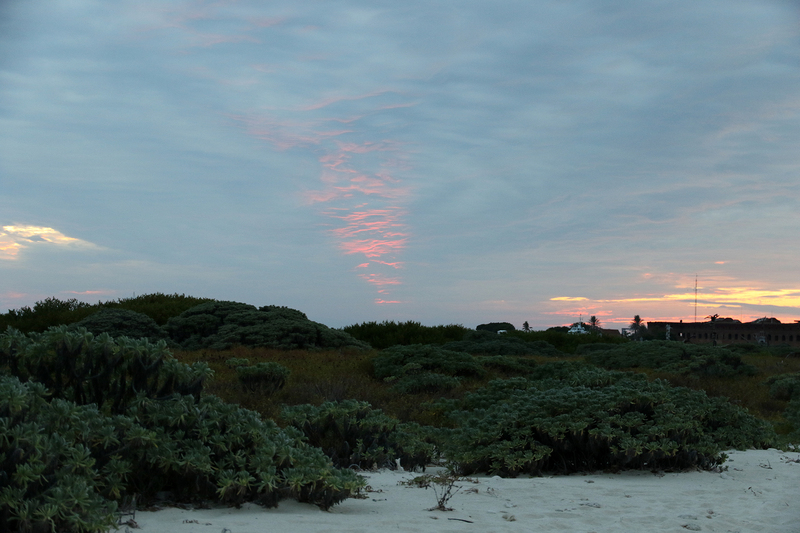 Like the previous evening, the skies were overcast, but evocative. 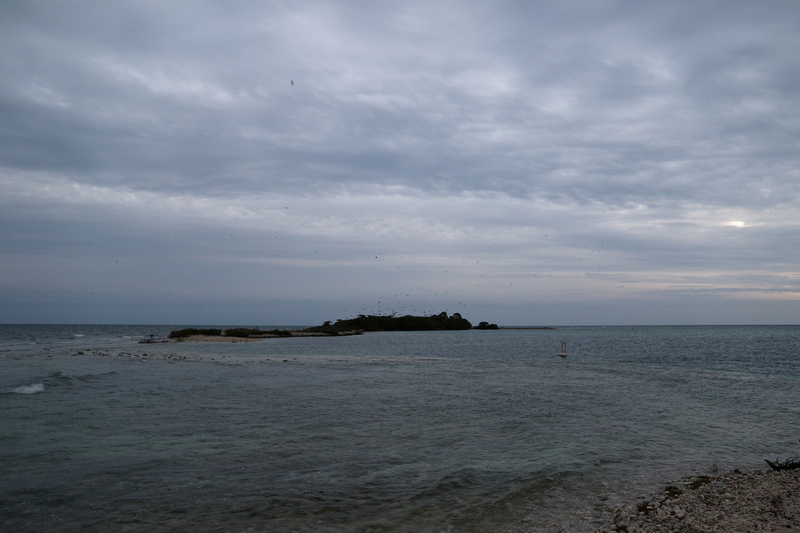 Although we weren’t thinking this at the time, it’s difficult to look at these low clouds and not think about how terrifying it would be to experience a hurricane churning across these tiny islands and literally reshaping them in a couple of hours. 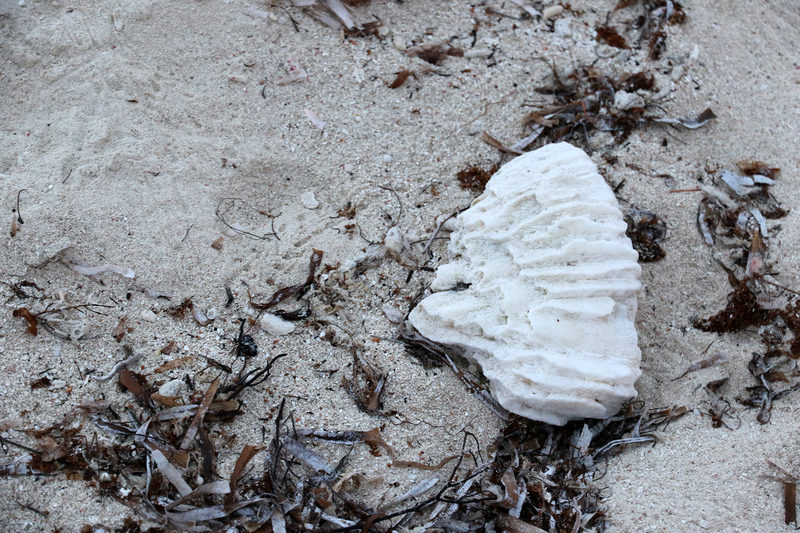 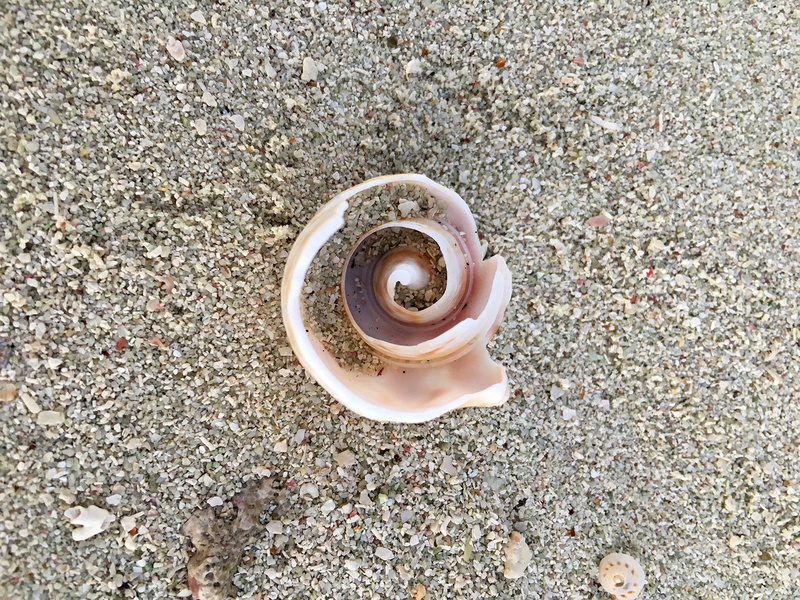 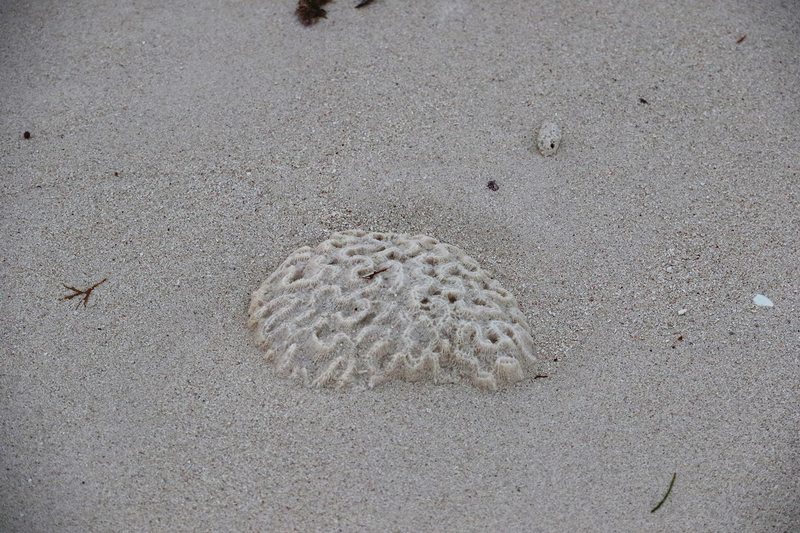 What is it about humans that inspires us to create shapes and patterns out of shells and corals found along the shore? 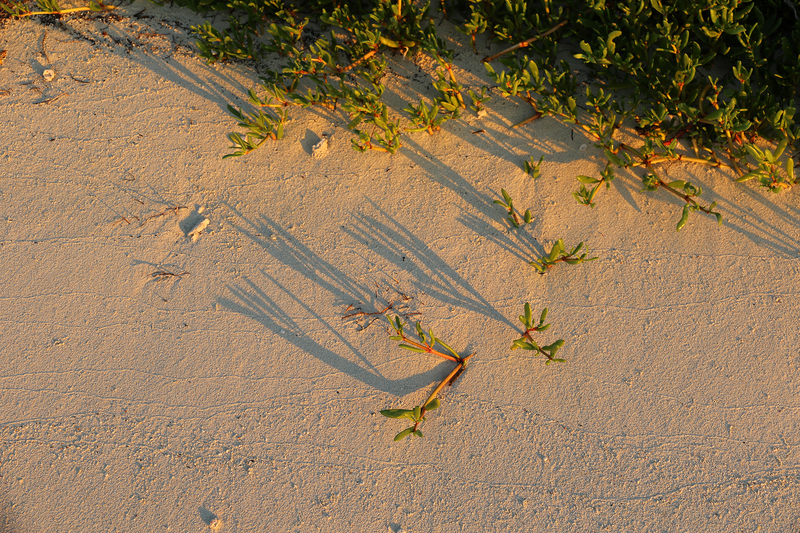 Is it a compulsion to art? 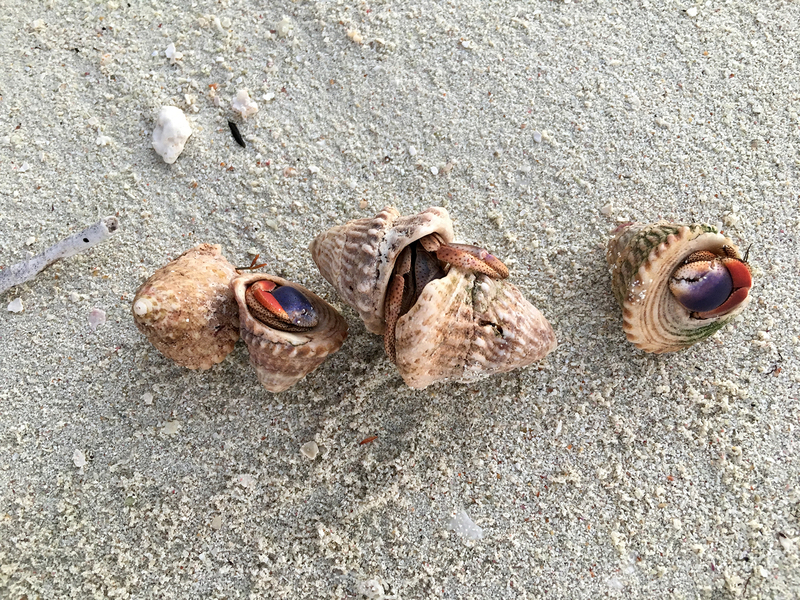 To communicate? 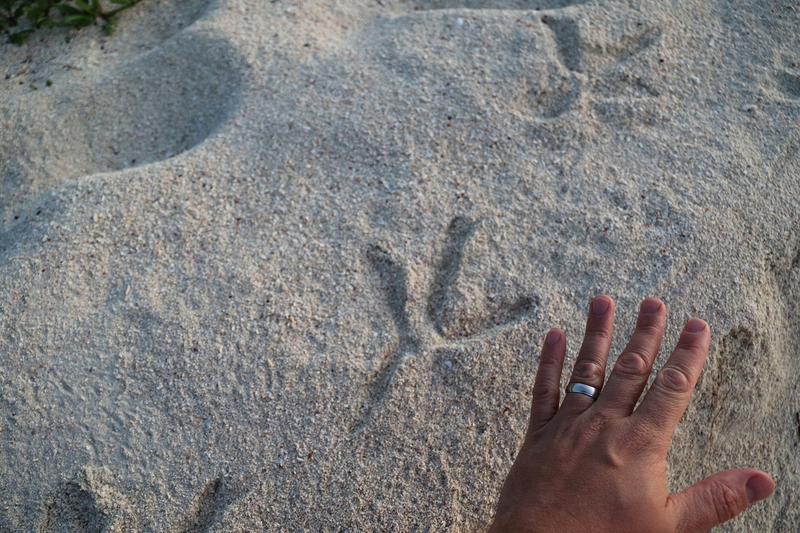 To say “we were here”? 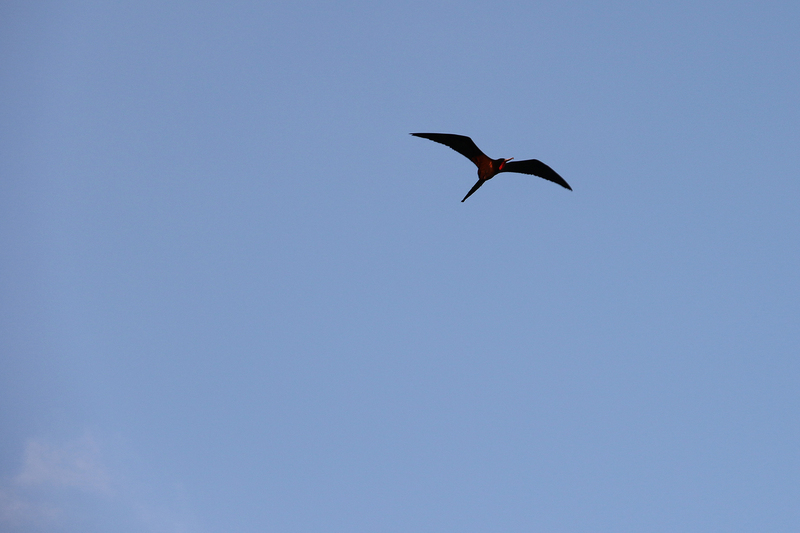 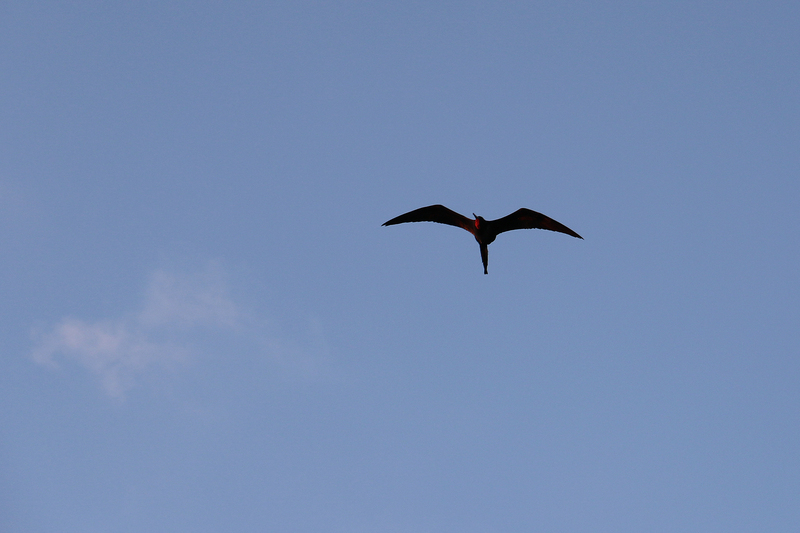 We witnessed the same phenomenon, in a spectacular fashion, at Virgin Islands National Park. 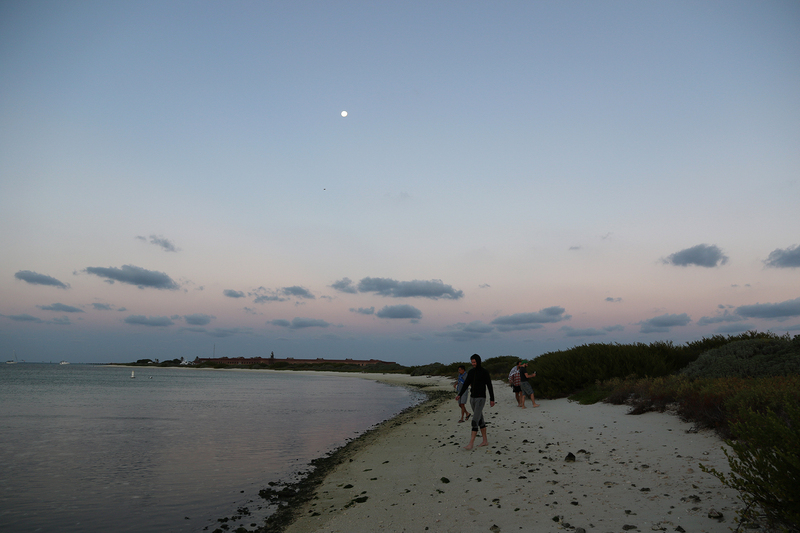 And of course, being human, we contributed to the phenomenon. 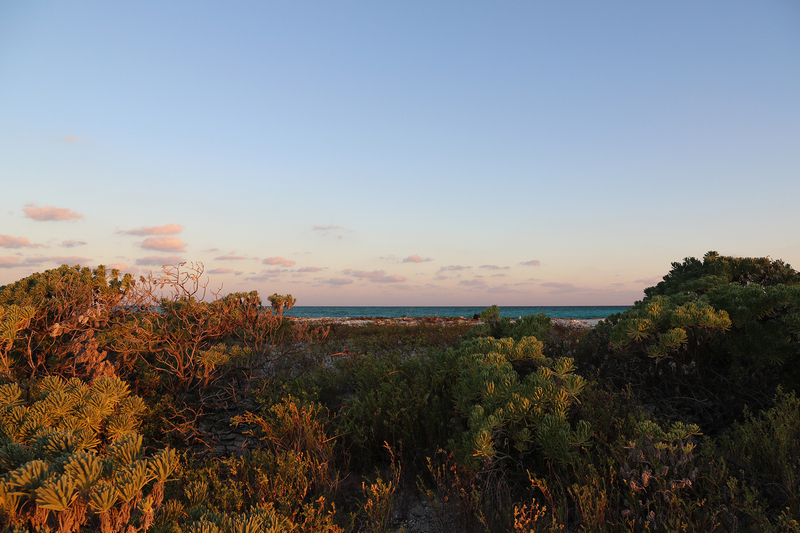 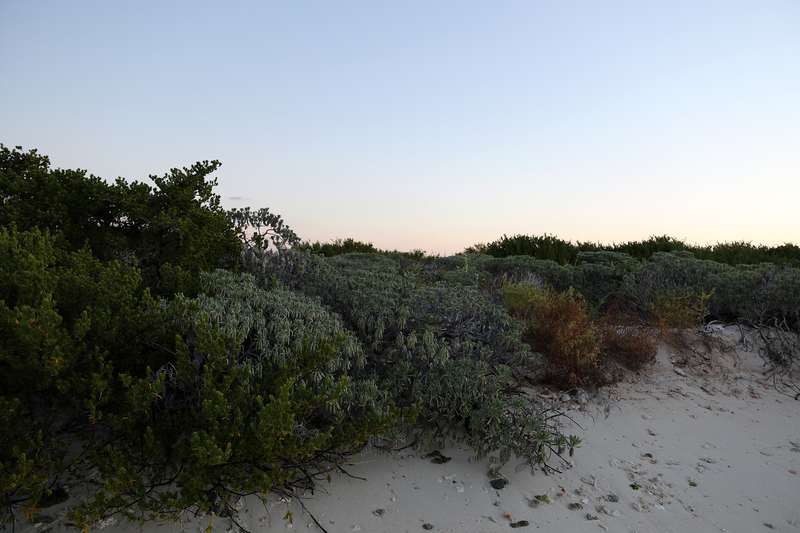 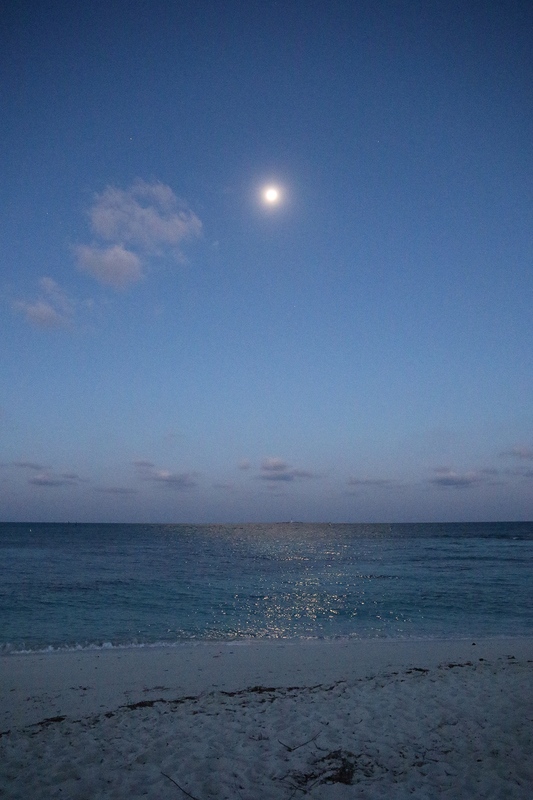 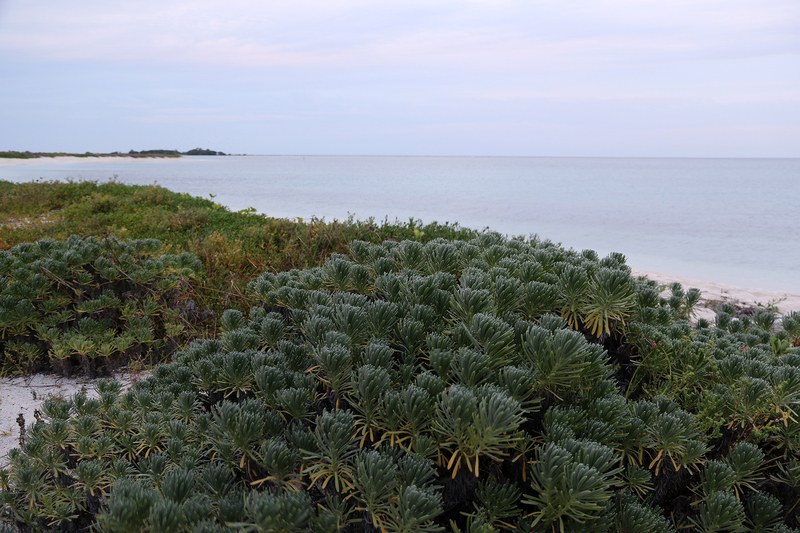 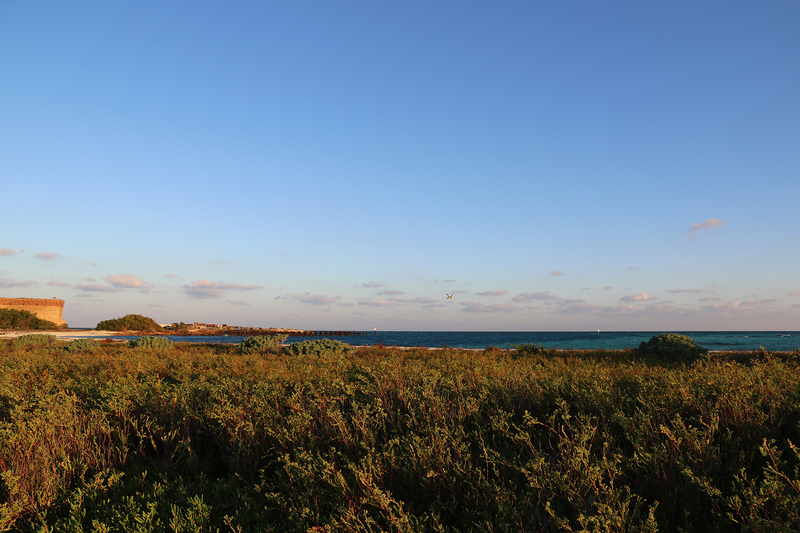 Walking back along the tranquil south shore of Bush Key felt like a lullaby. 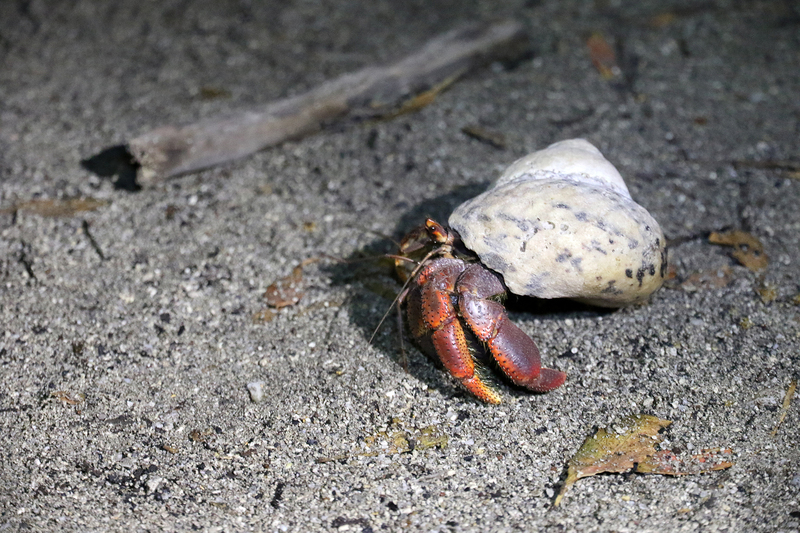 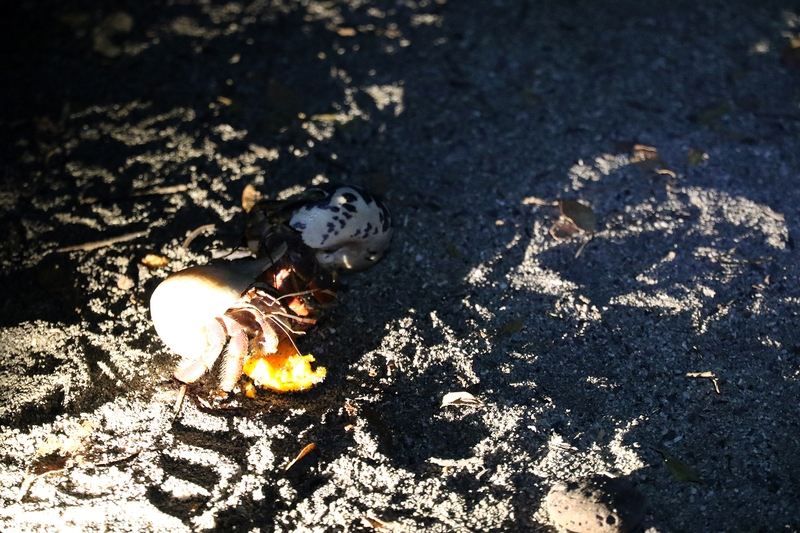 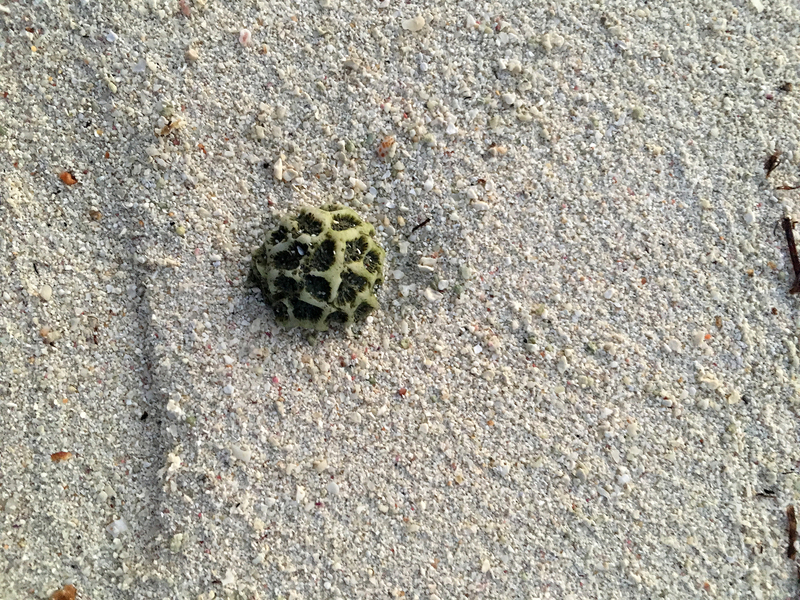 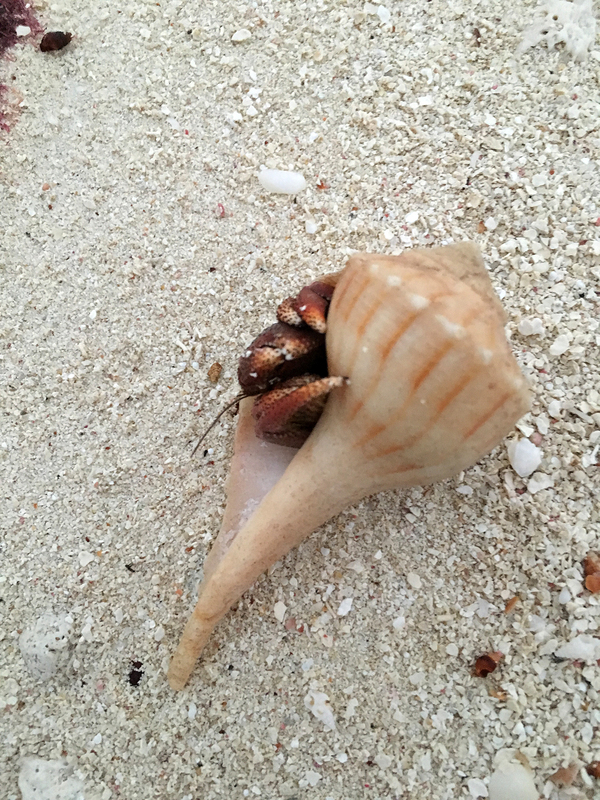 We noticed that we were visited by a little menagerie of Hermit Crabs, some of whom were quite large and territorial. 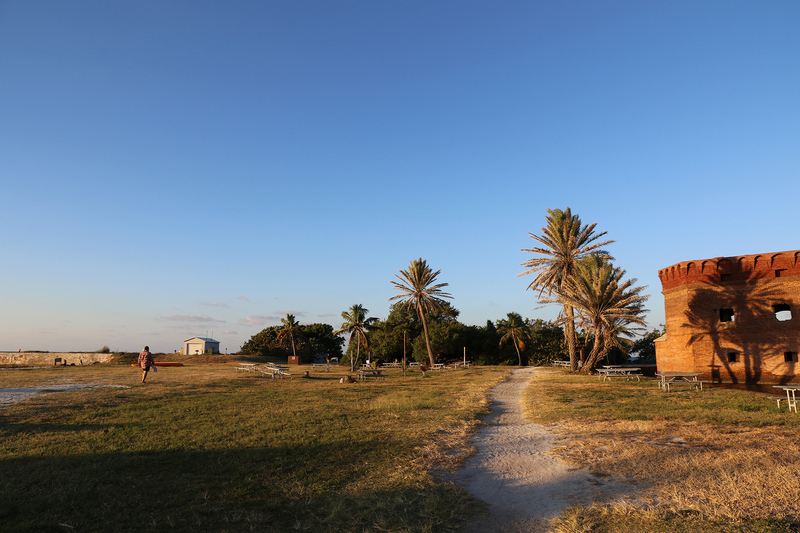 We even witnesses a couple fighting each other near our picnic table. 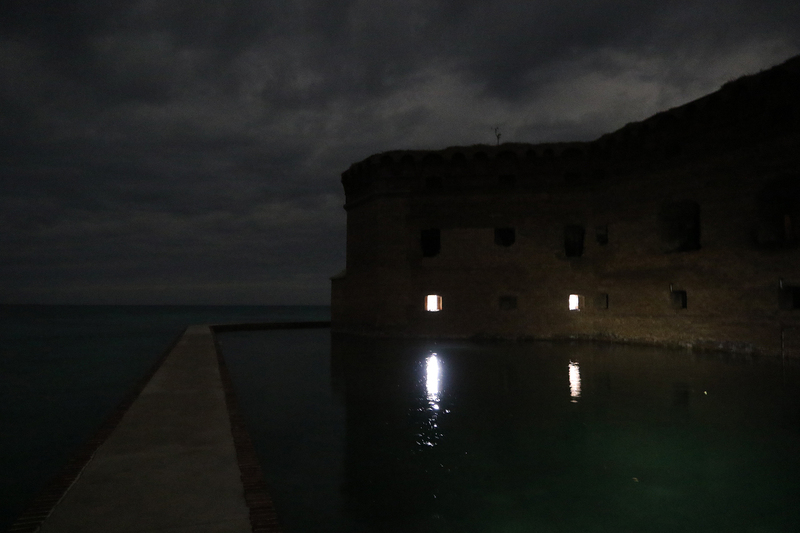 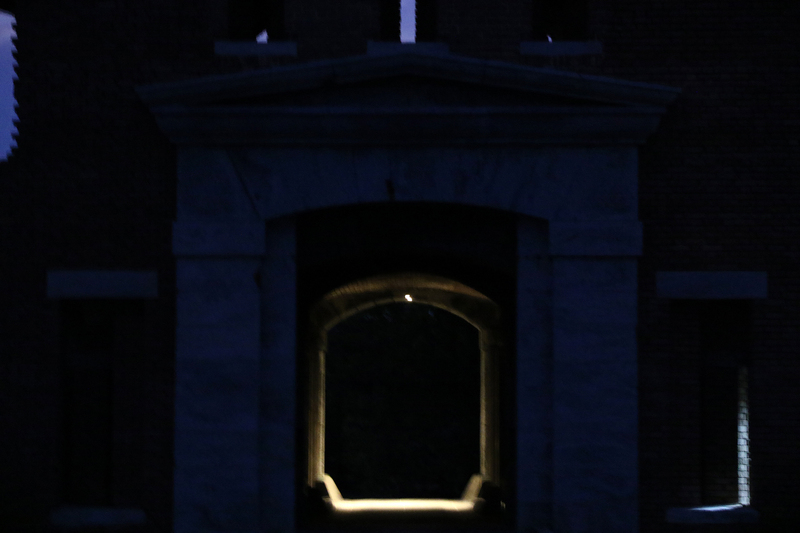 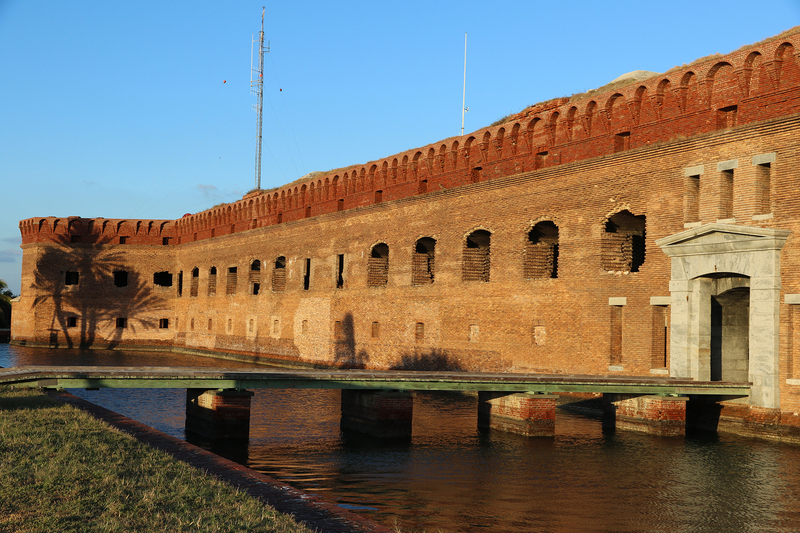 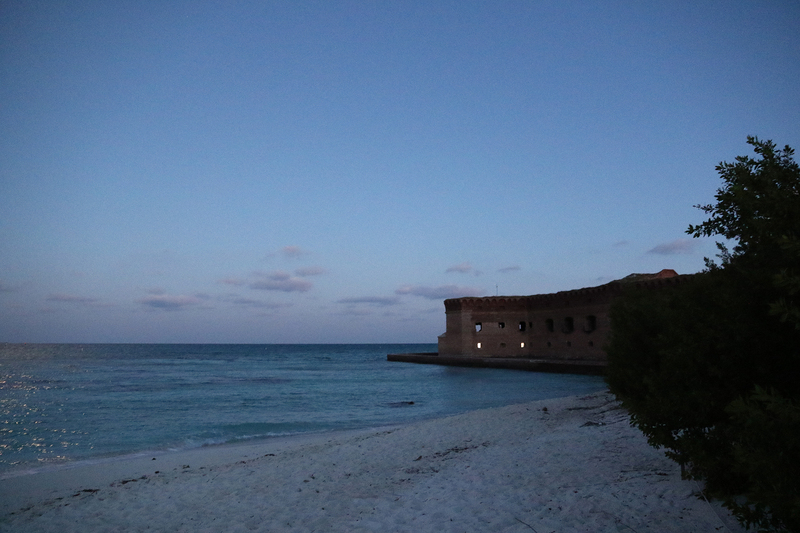 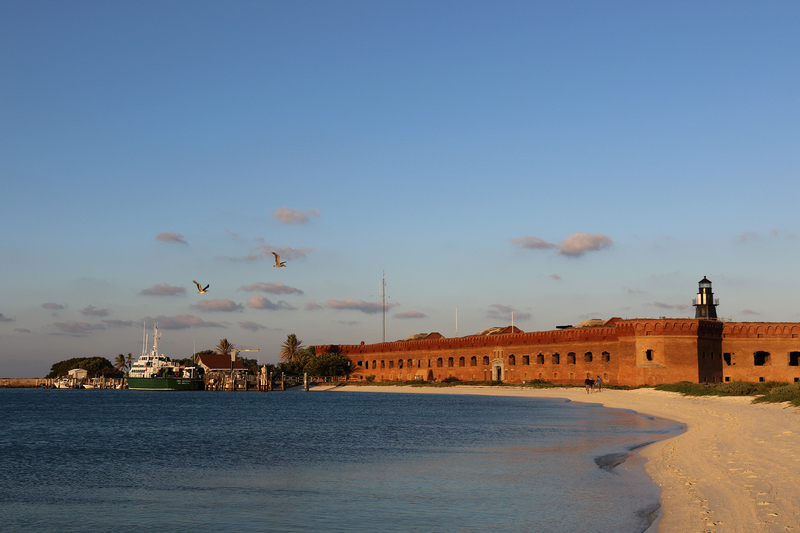 Sean and I went on a moat walk, expecting to relive the magic of our multiple moat walks from the night before, but this night the surf was up a bit and around on the north side of Fort Jefferson waves were occasionally crashing over the moat wall, which was unnerving. 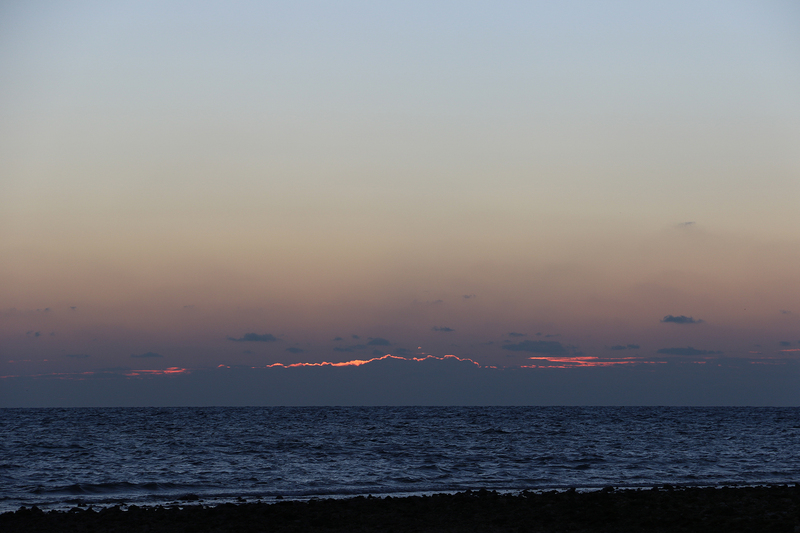 So once around was quite enough. 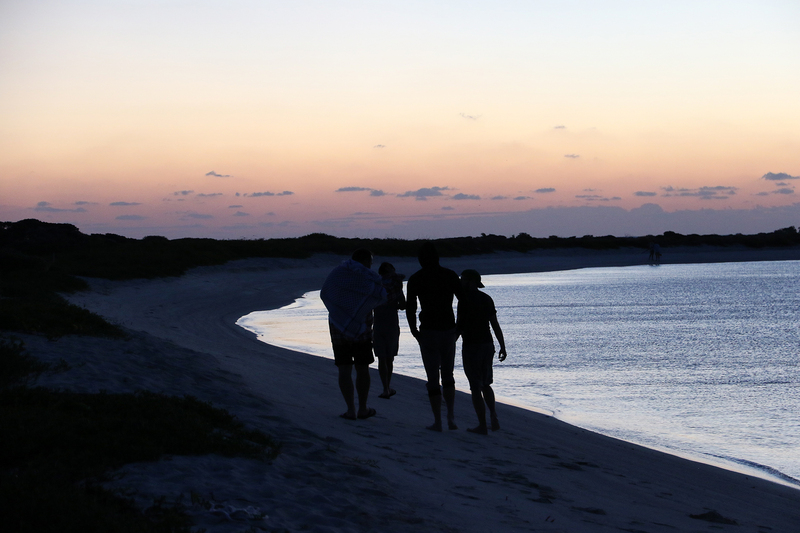 We all ended up turning in early. 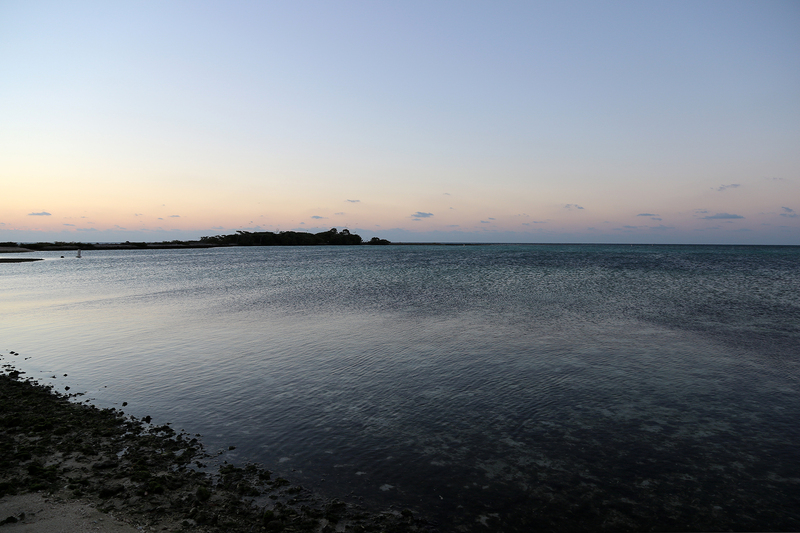 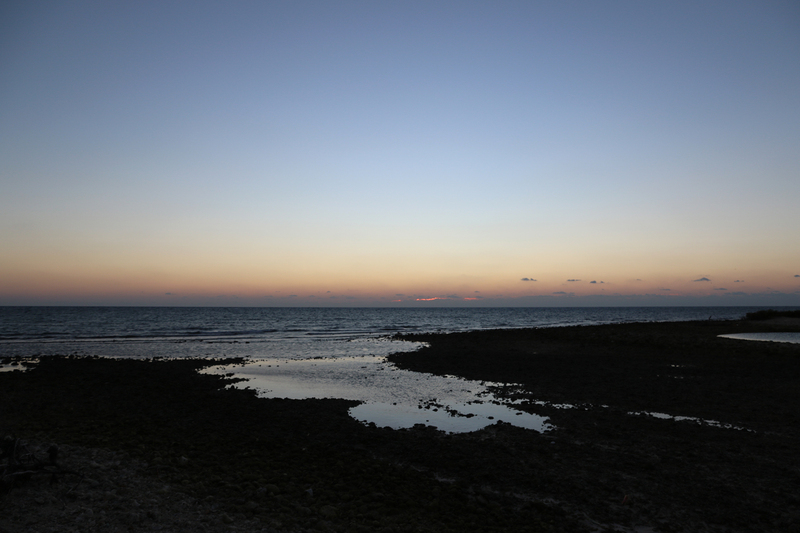 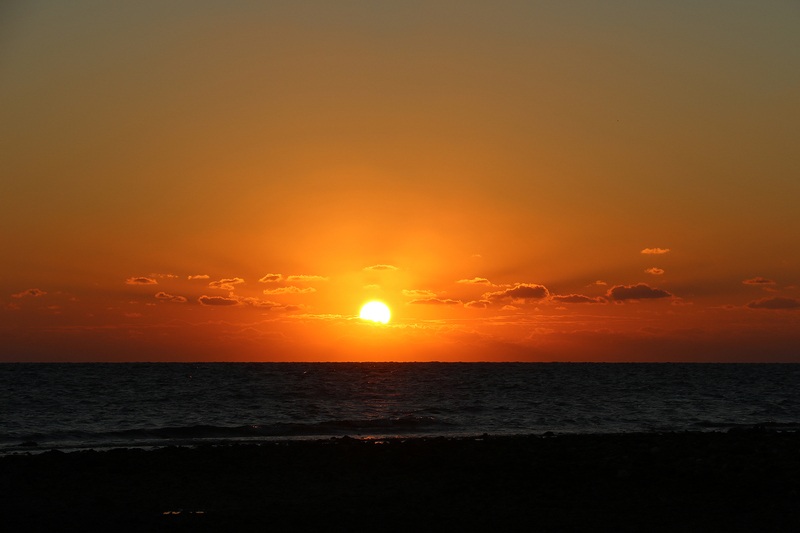 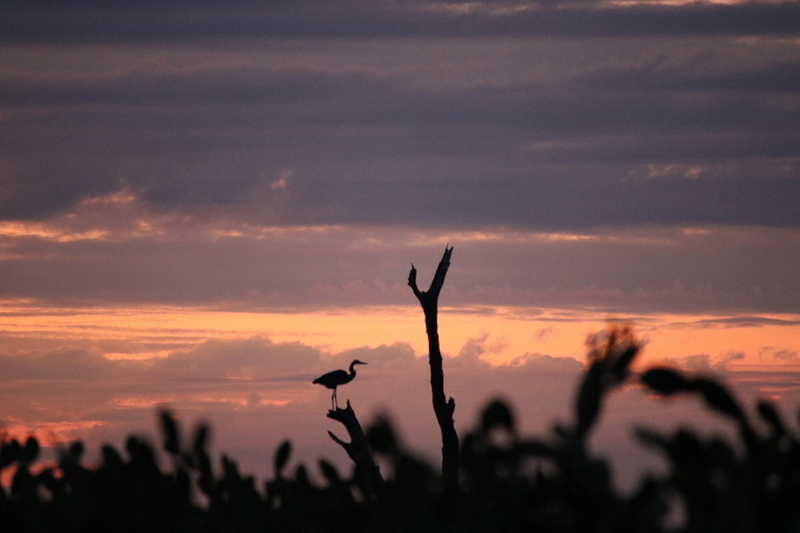 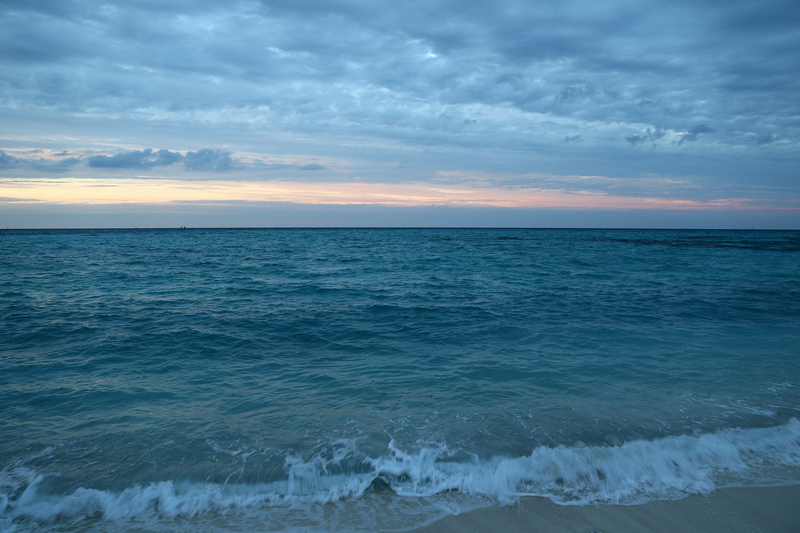 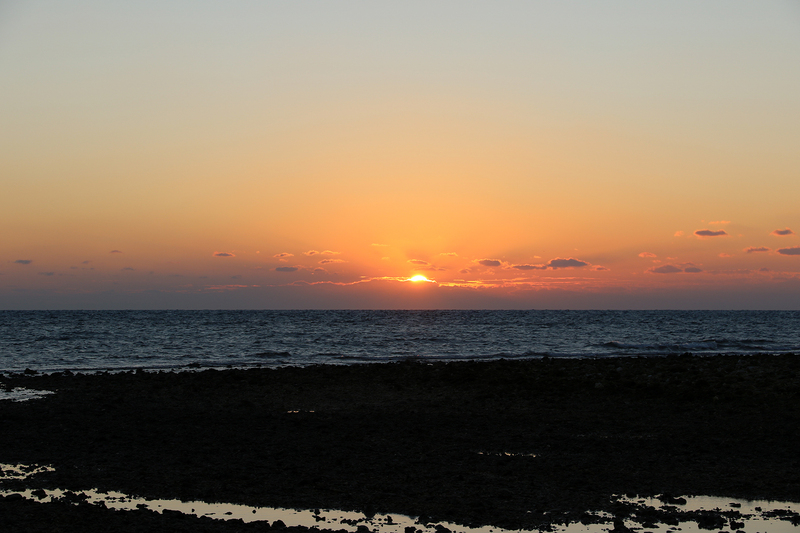 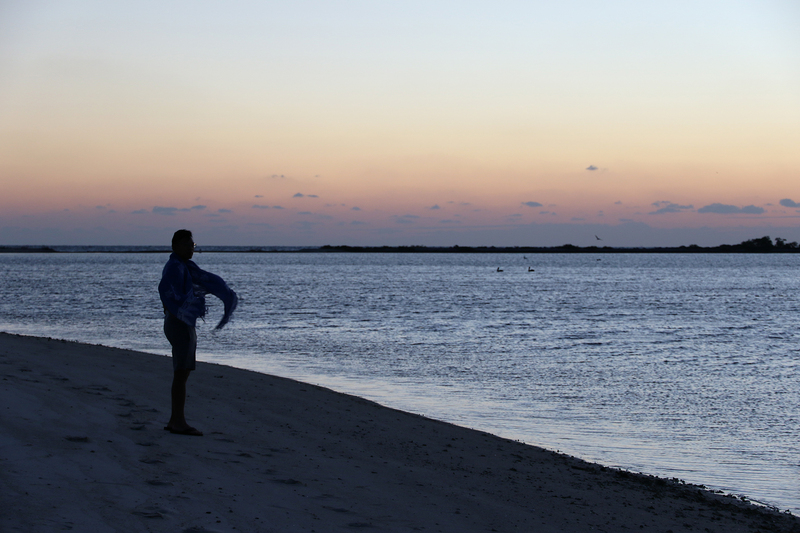 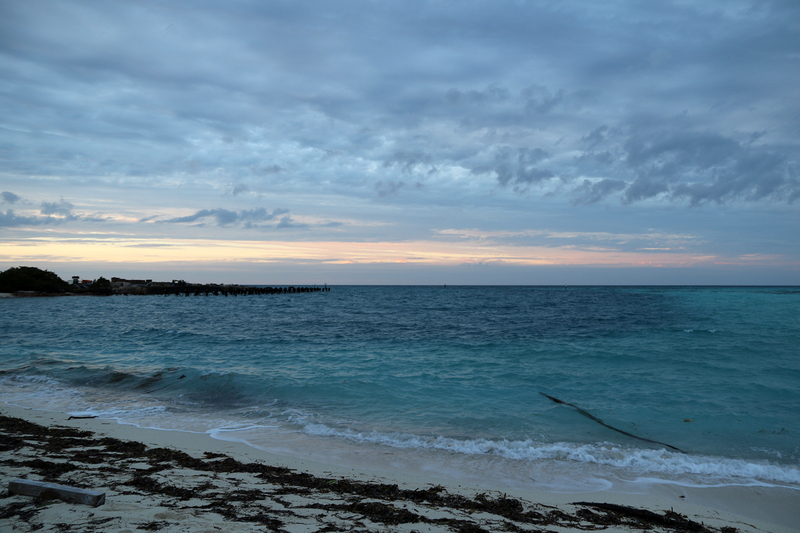 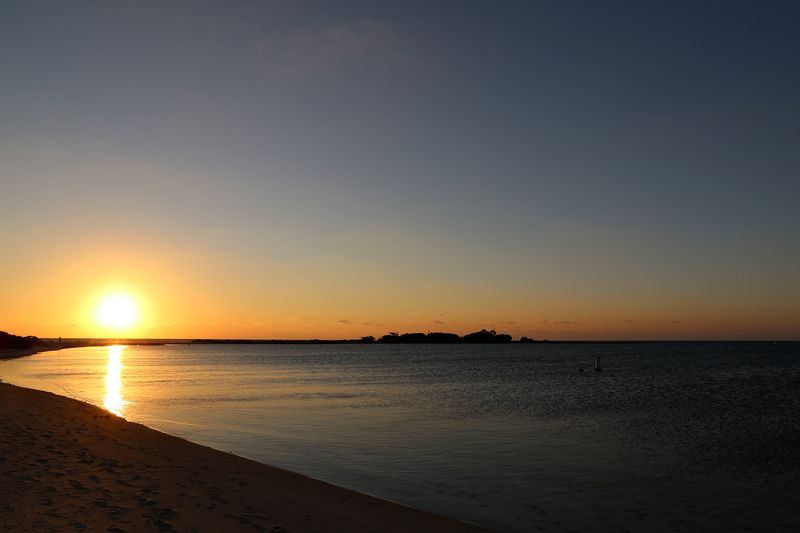 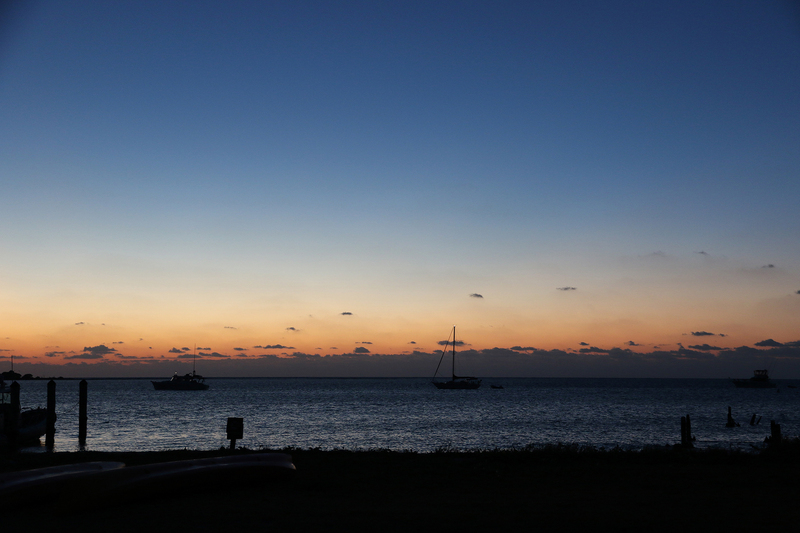 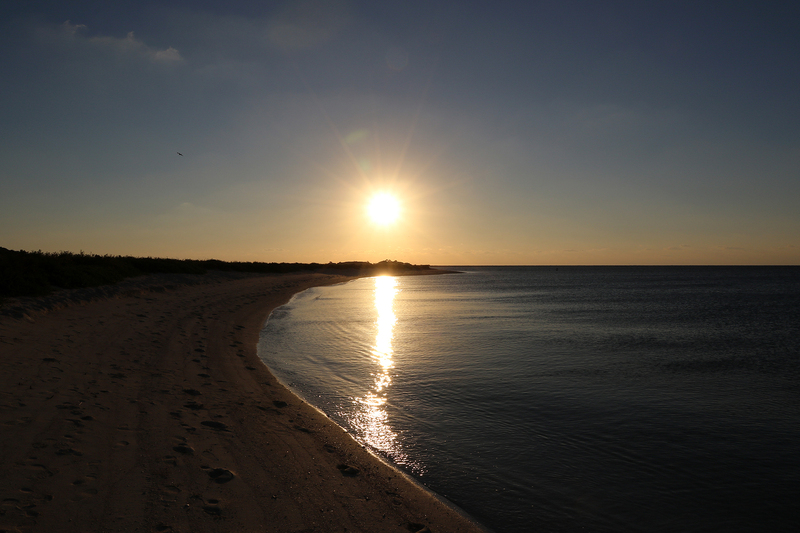 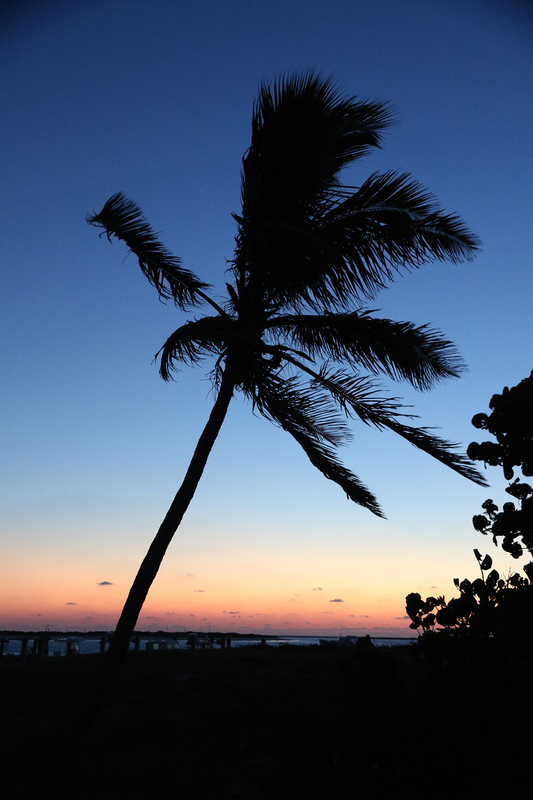 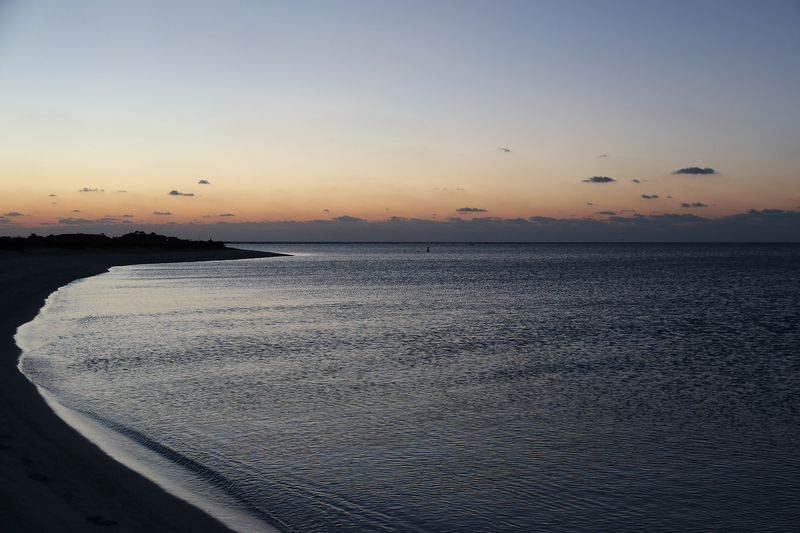 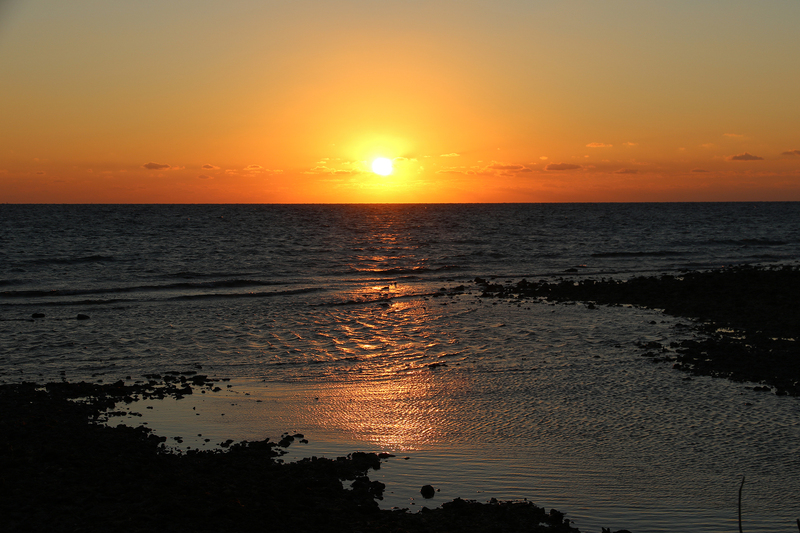 We Chicagoans intended to get up for the sunrise over Bush Key. 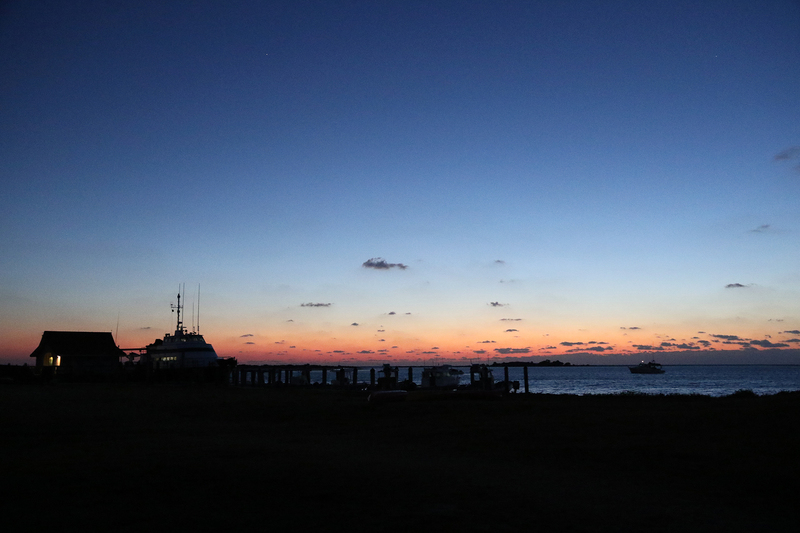 Wednesday morning, November 16, 2016, was mostly clear and calm with just a low layer of clouds on the horizon. 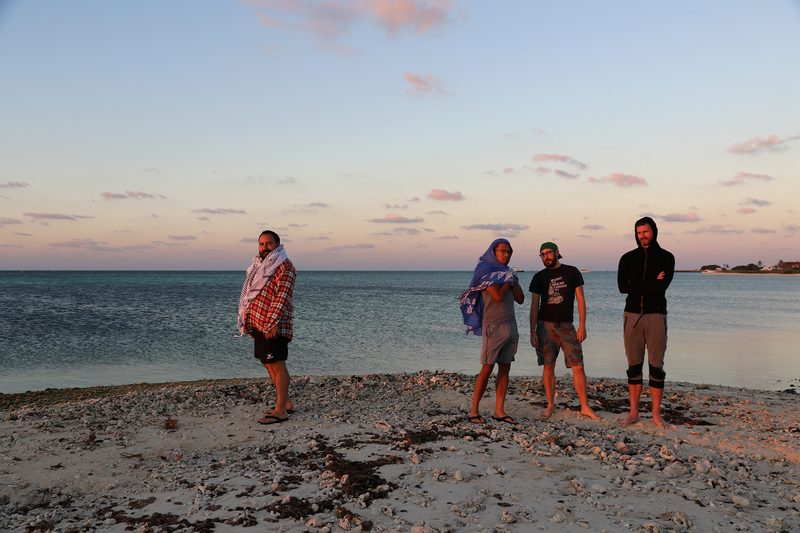 Sean, Noah, Nick, Juan, and I awoke pre-dawn, wrapped ourselves in our sarongs, and wandered toward Bush Key for the sunrise. 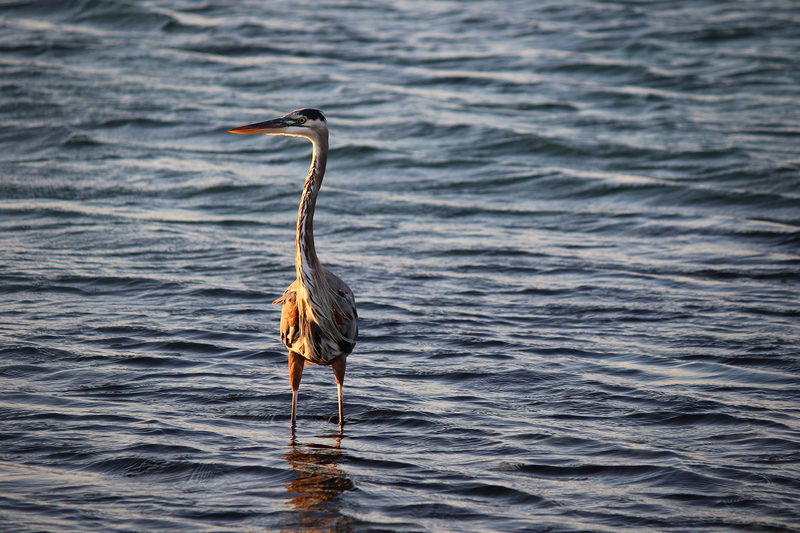 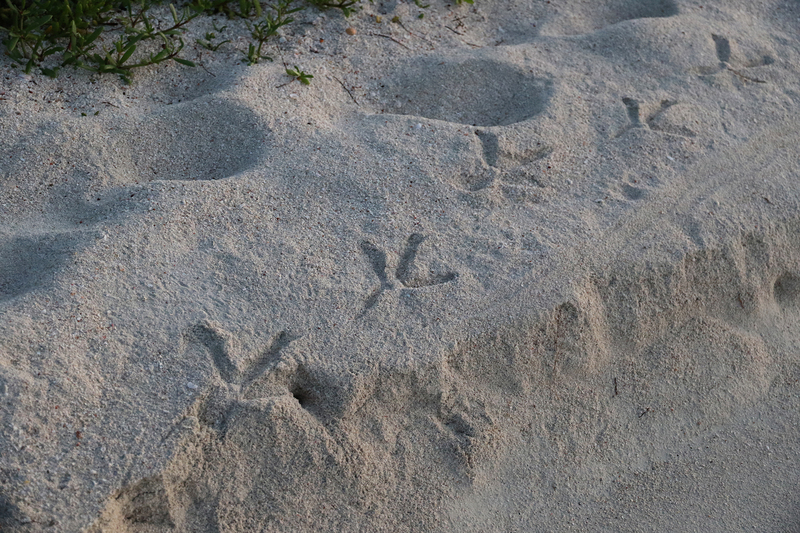 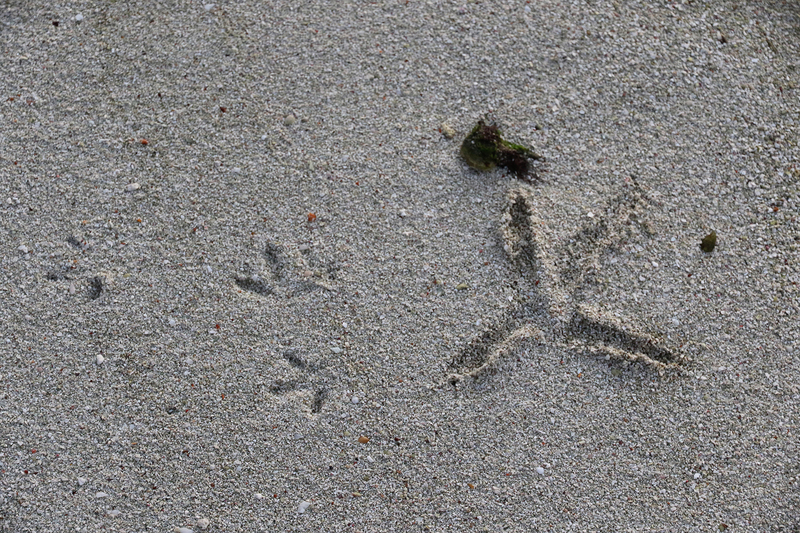 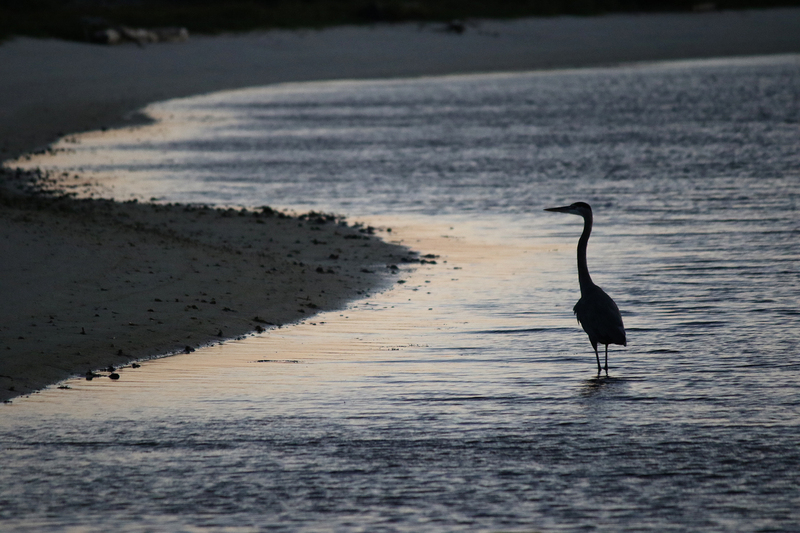 Out on Bush Key, we noticed the large tracks made by our Great Blue Heron friend. 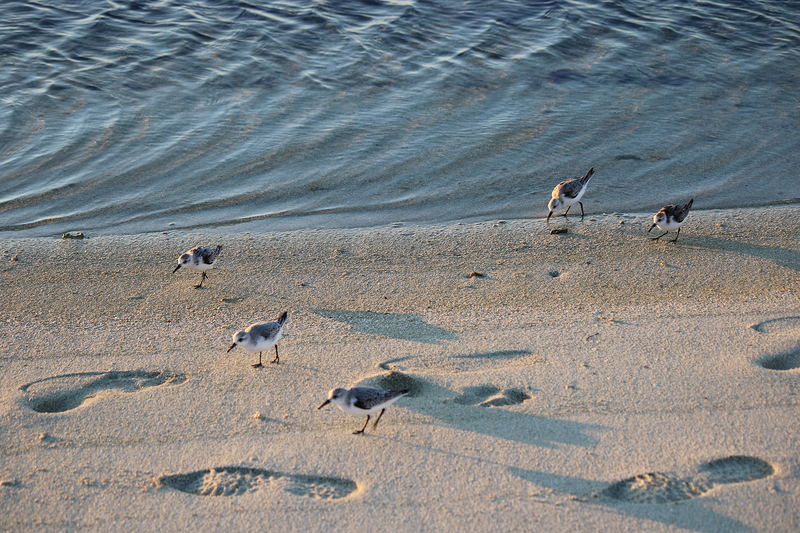 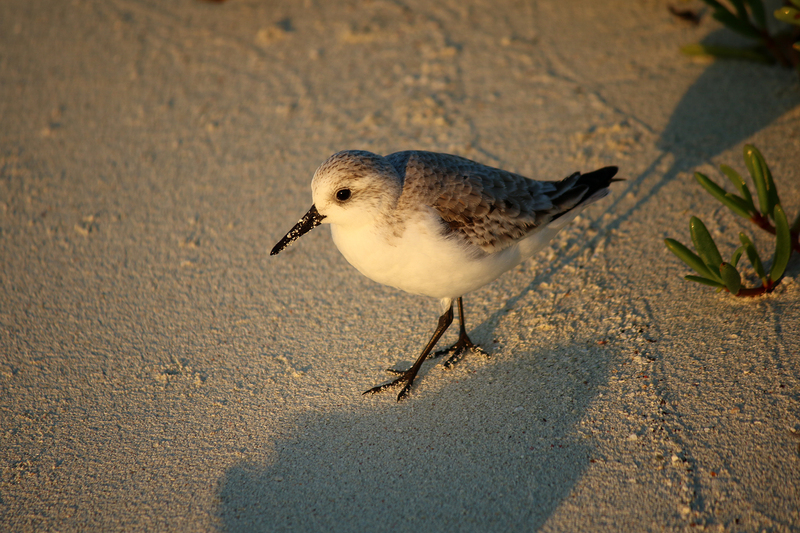 They were huge, particularly compared to the tiny tracks of the Sanderling army. 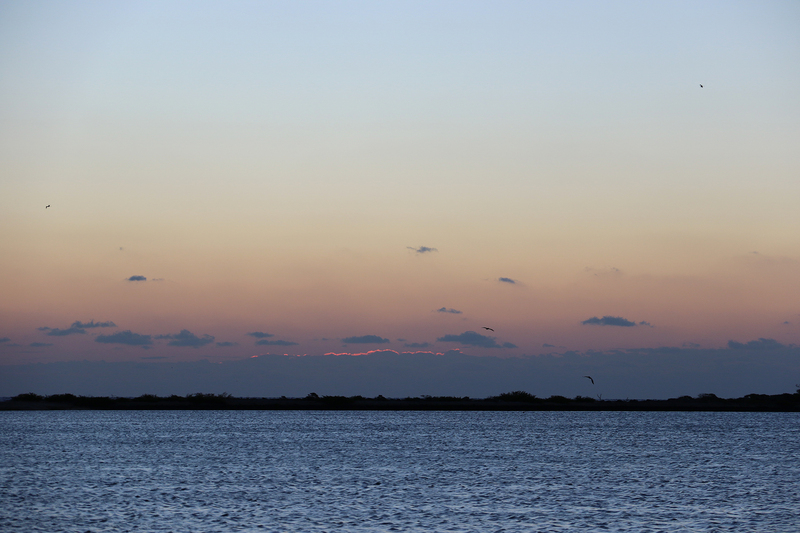 It was an exquisite morning, cool in anticipation of a warm, sunny day. 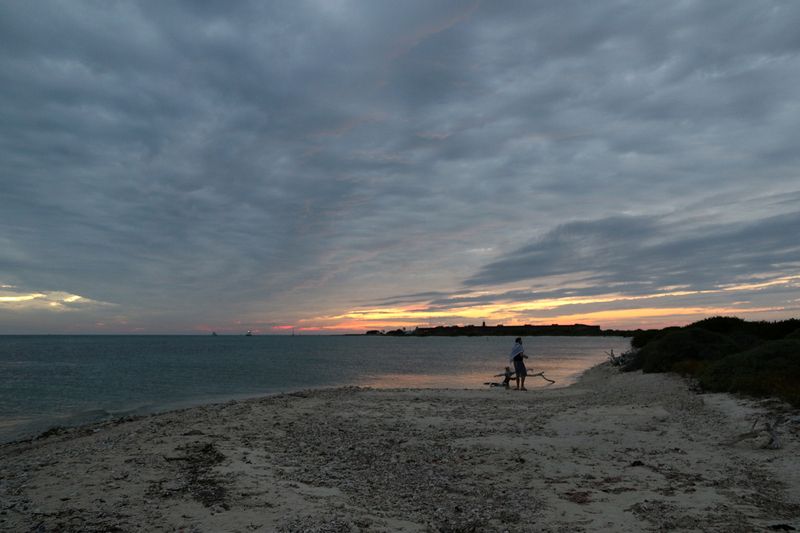 As we walked out to the end of Bush Key, we were not alone. 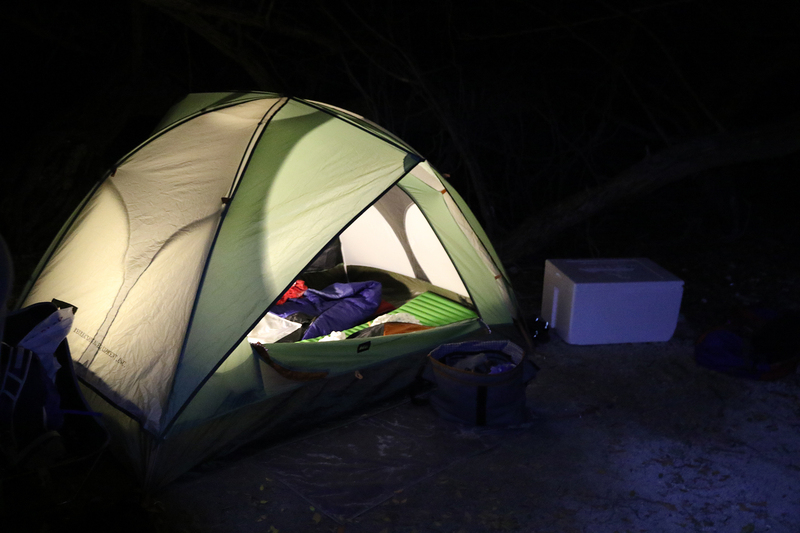 A couple of campers from the group that had arrived the previous day were walking out too, a couple dozen yards ahead of us. 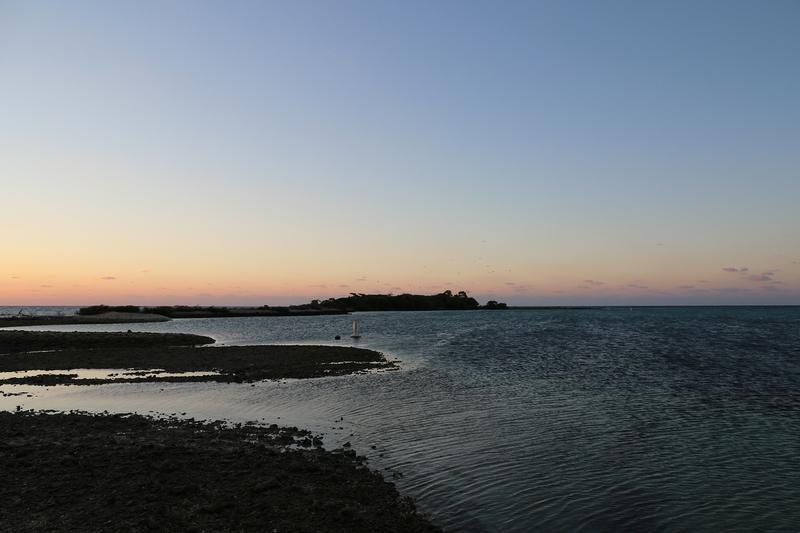 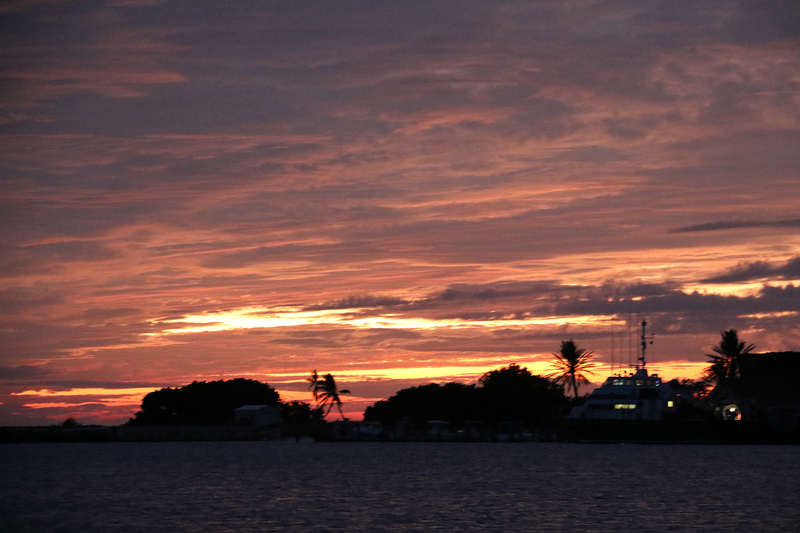 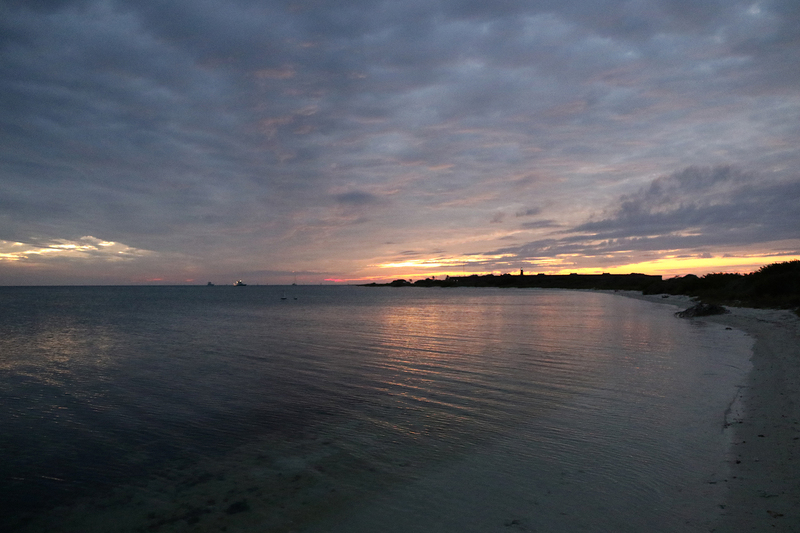 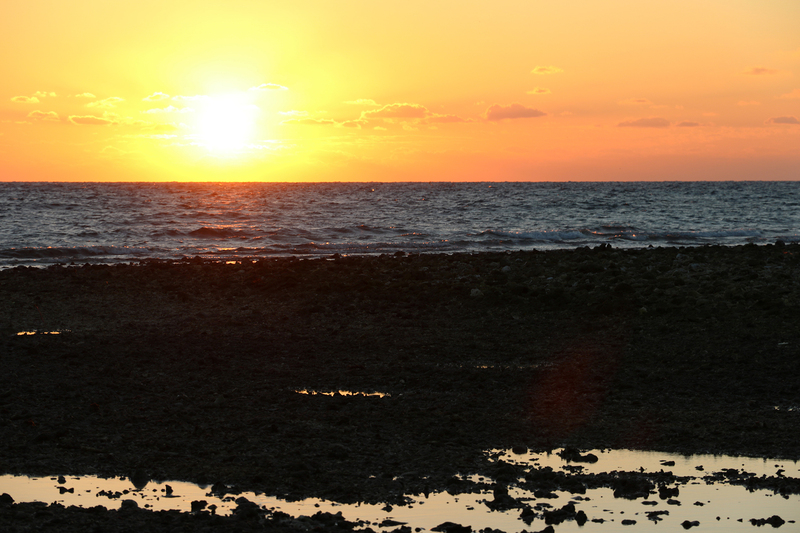 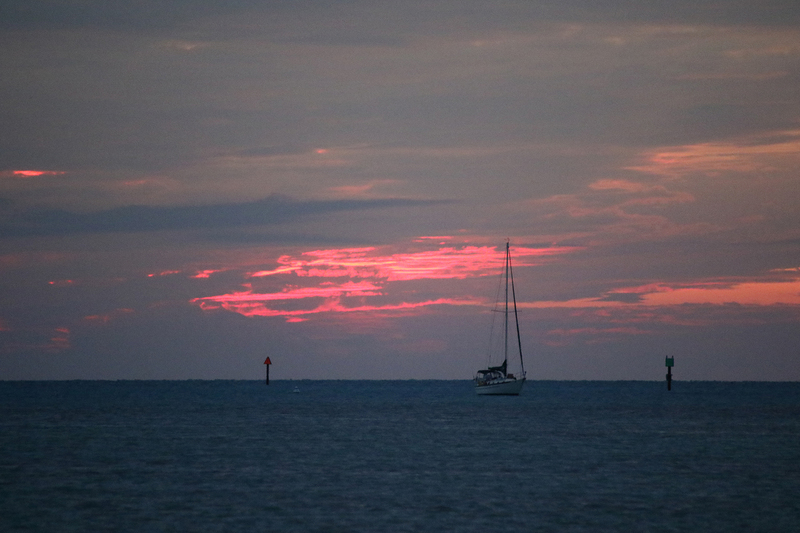 We were out at the eastern end of Bush Key in time to greet the sun. 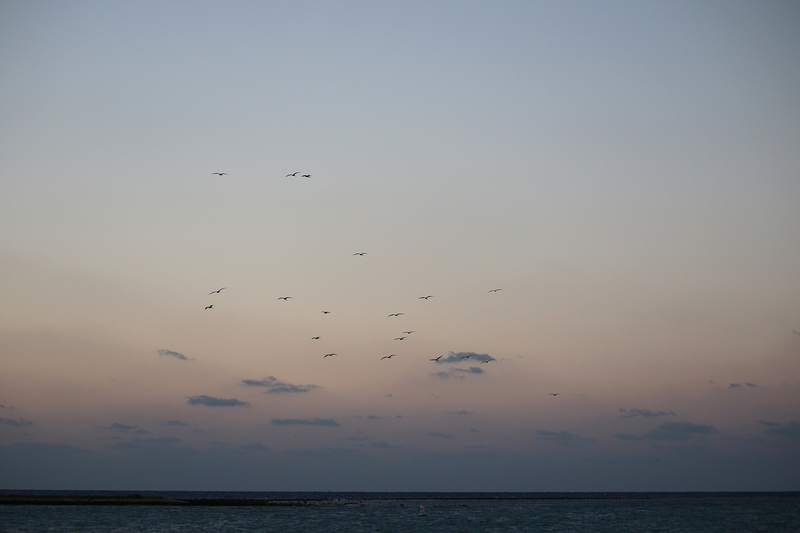 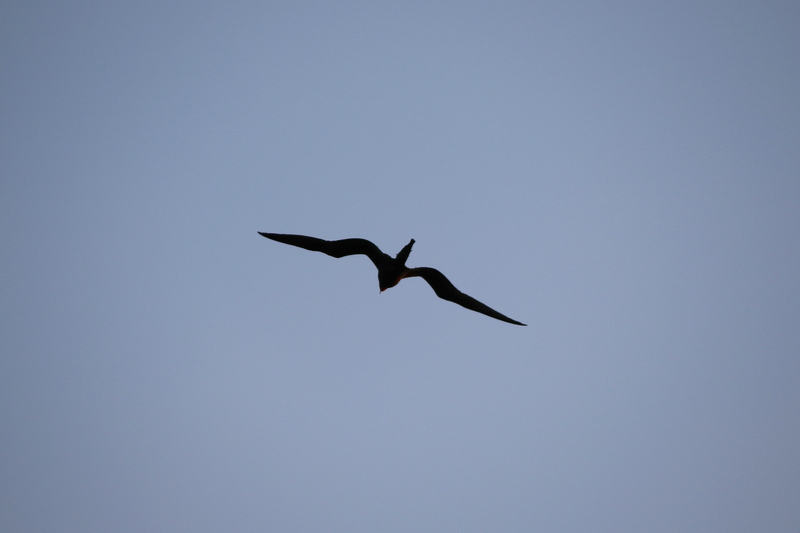 Once the sun was up, the birds took to the skies and the shore to begin their morning’s search for breakfast. 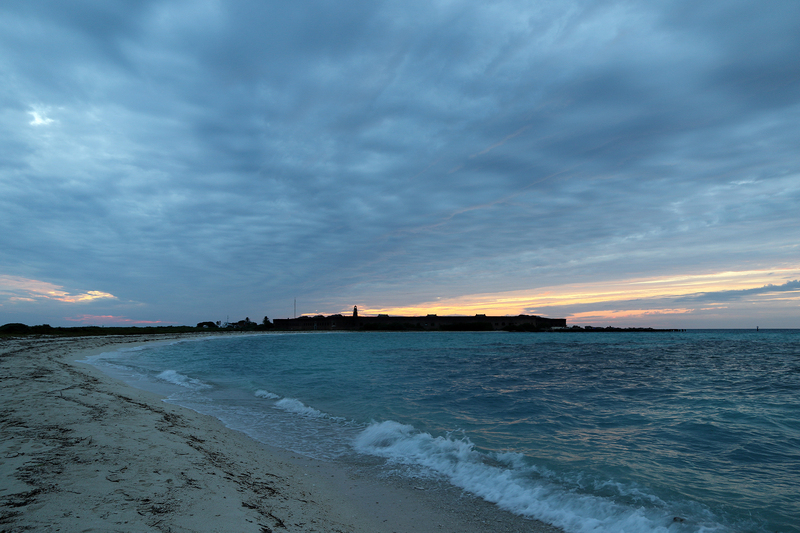 And we made our way back along the south shore. 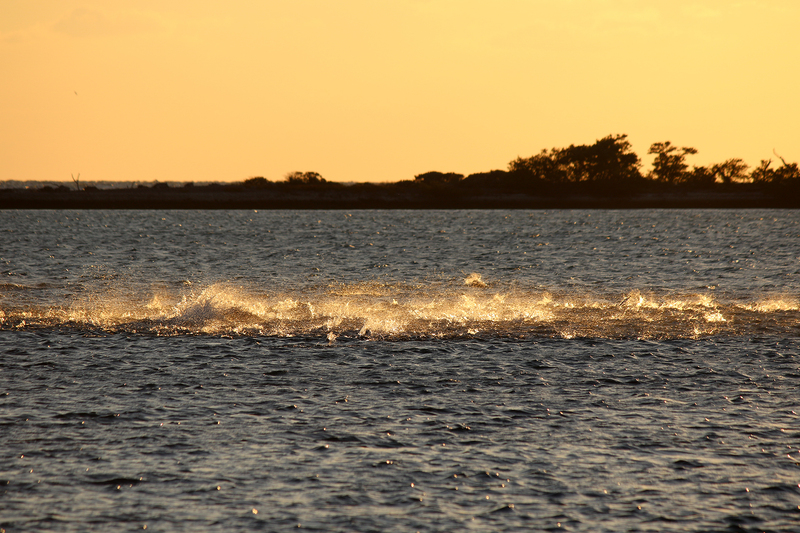 Suddenly the tranquility of the water was interrupted by a frenzy of Tarpons. 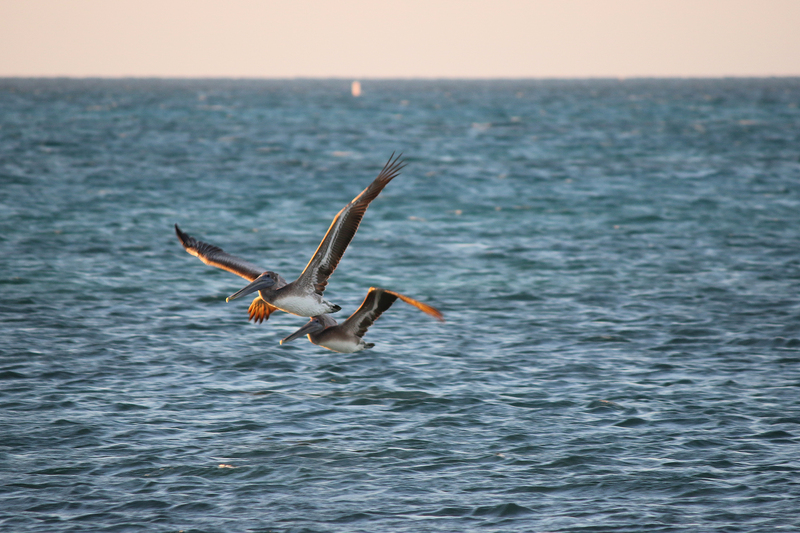 They appeared to be feasting on something and were in turn being scooped up by Brown Pelicans and Magnificent Frigatebirds. 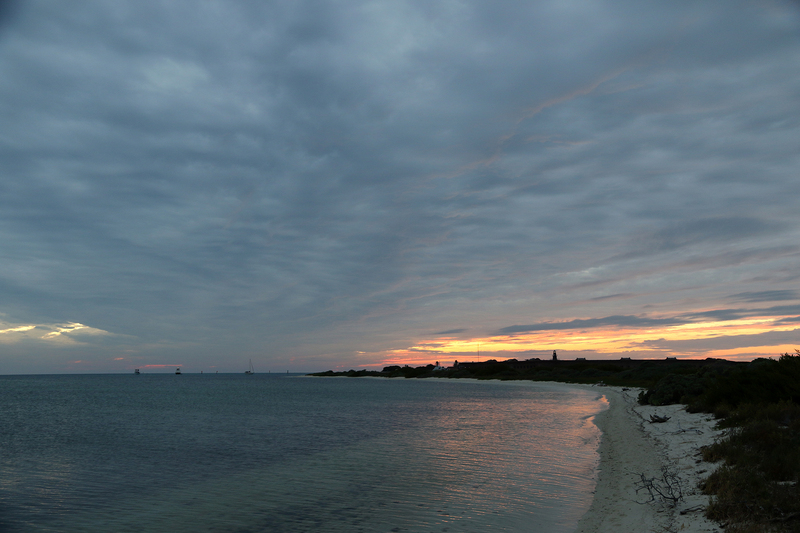 We watched for a bit before continuing back to Garden Key and camp. 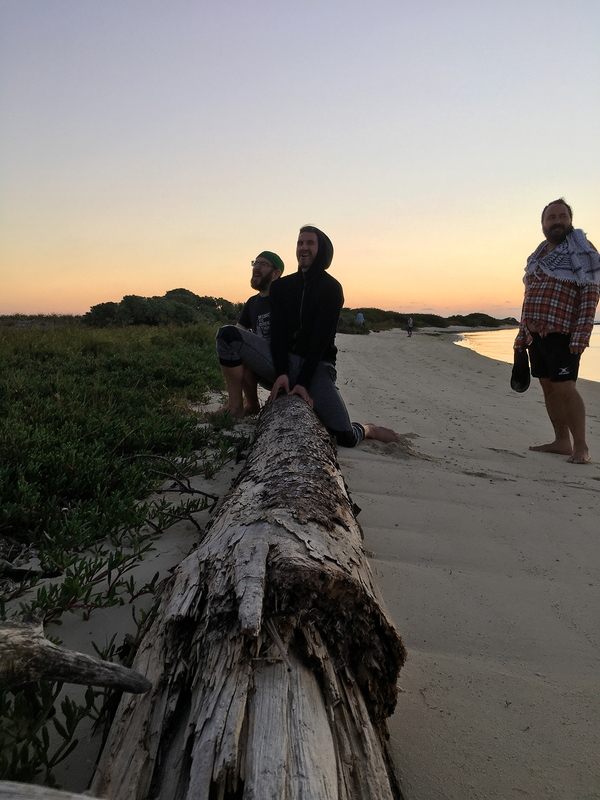 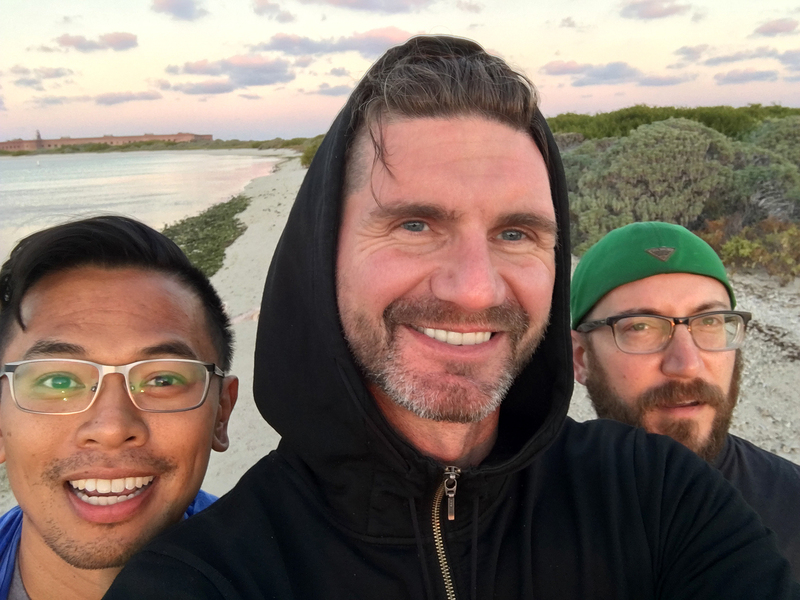 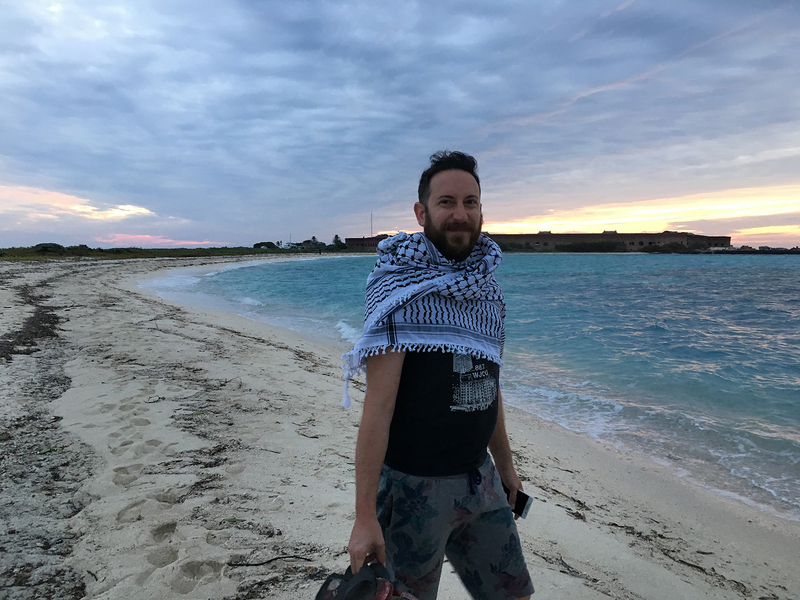 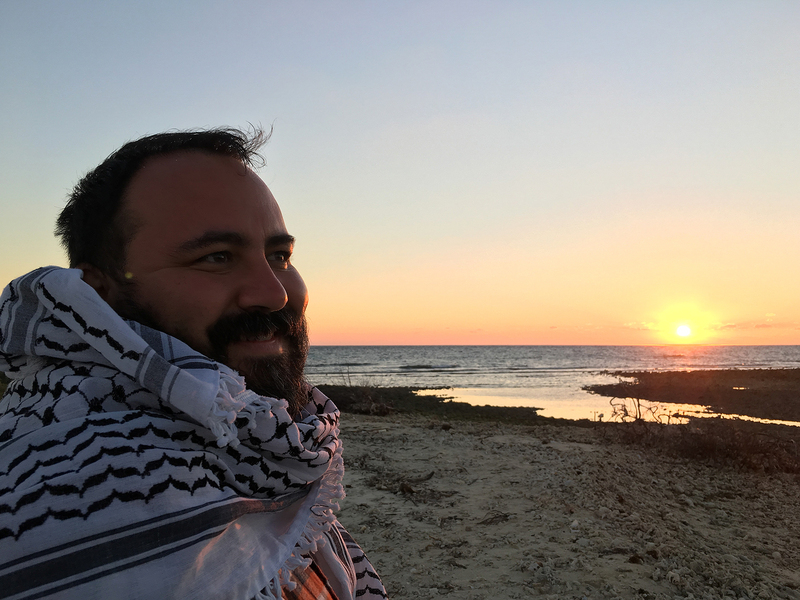 This entry was posted in Journey and tagged Camping, Day Hike, Dry Tortugas, Florida, Florida Keys on October 5, 2017 by Brandon Hayes. 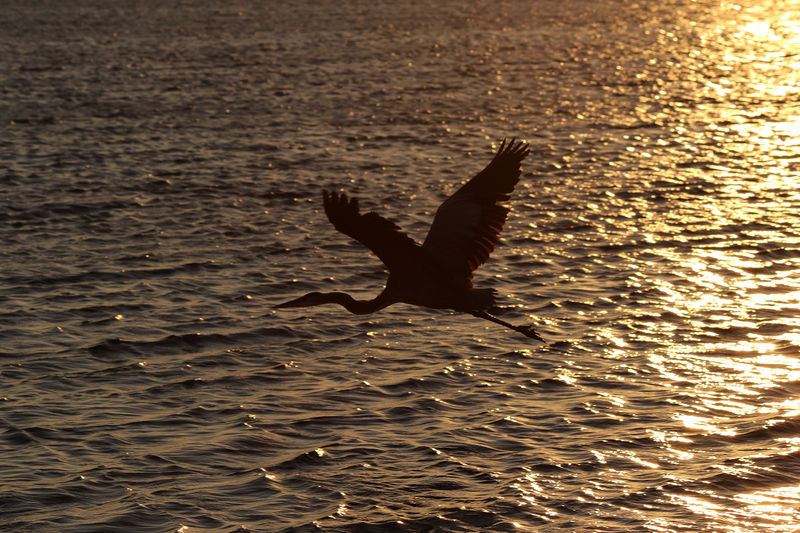 Thank you for sharing these beautiful moments!